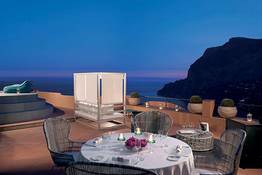 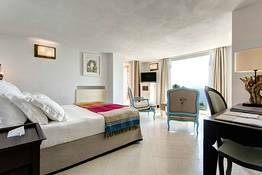 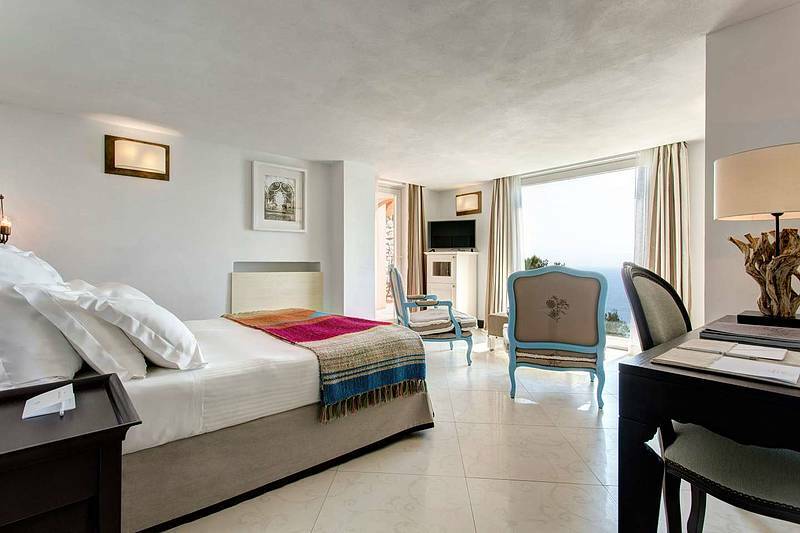 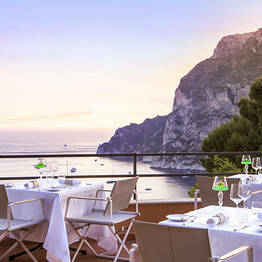 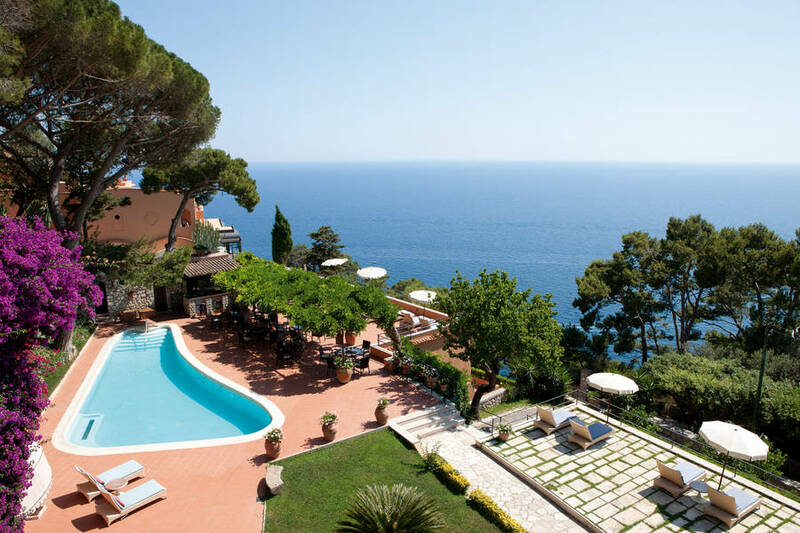 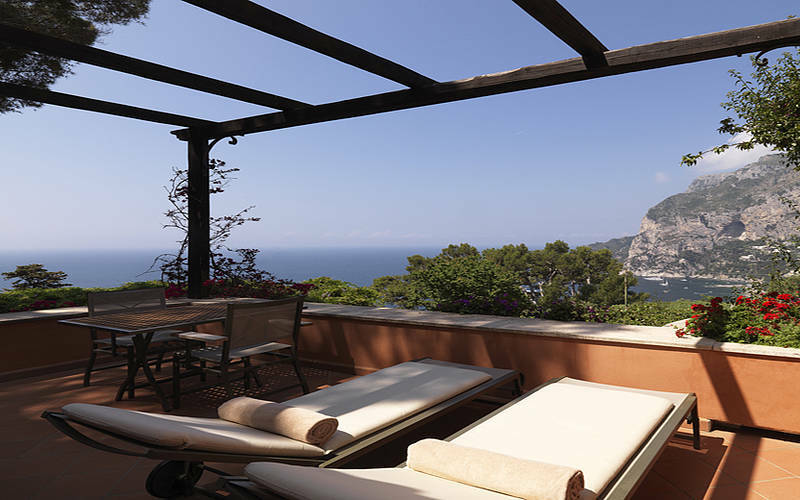 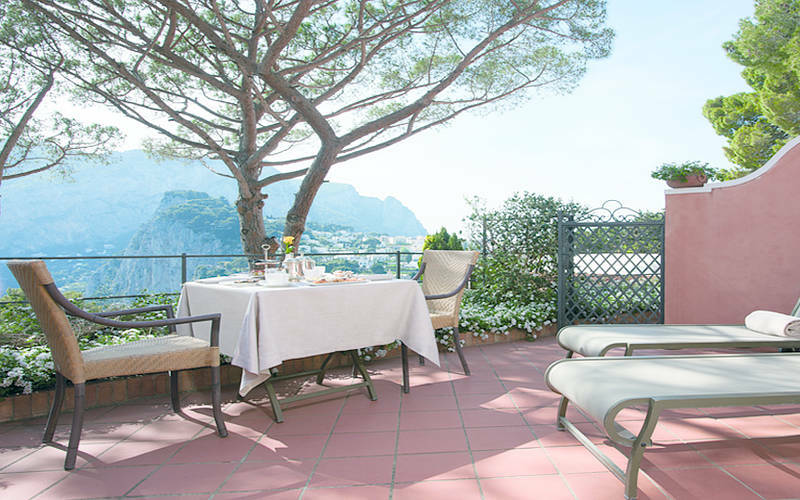 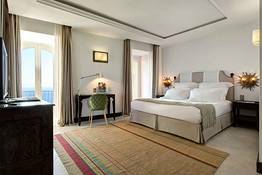 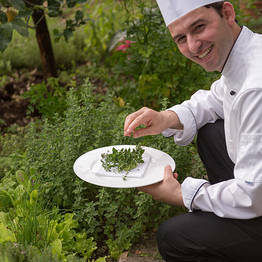 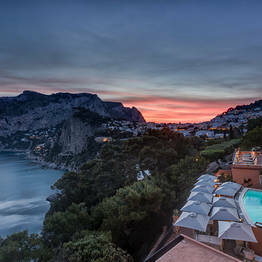 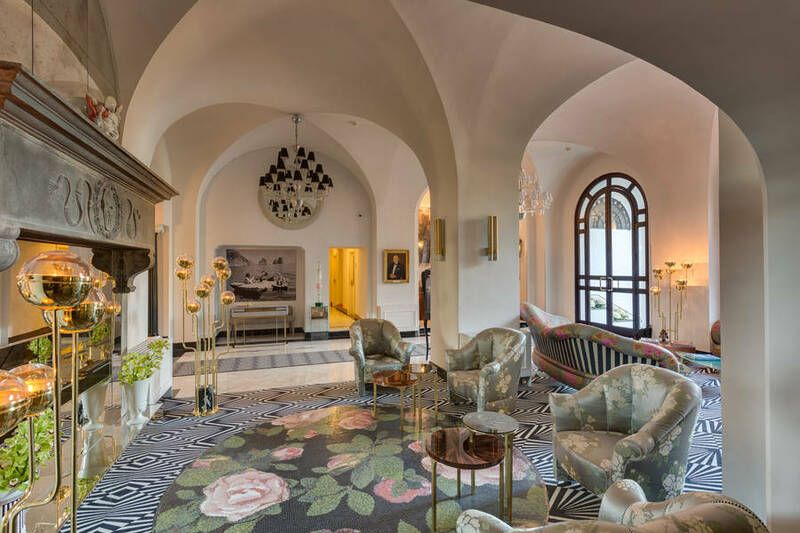 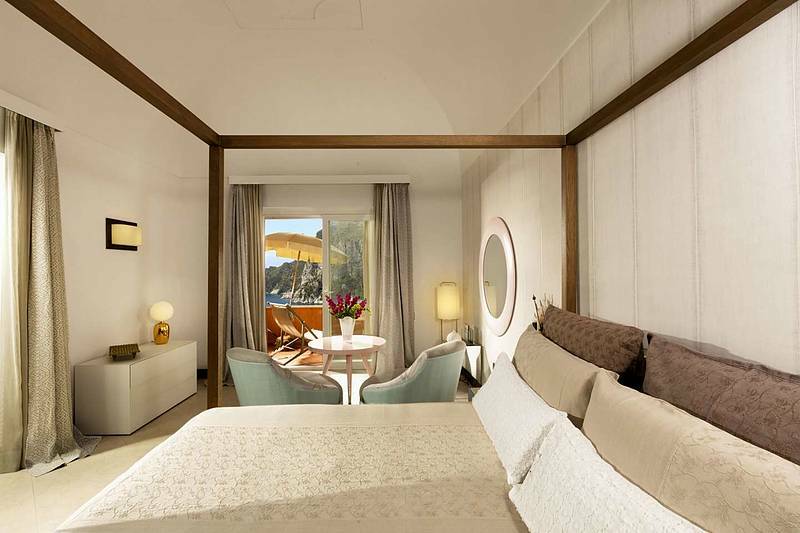 Hotel Punta Tragara Capri: 3 reasons to book here | Capri Booking. 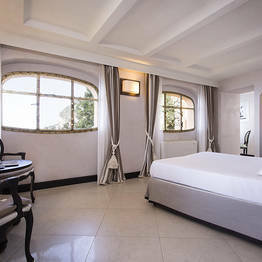 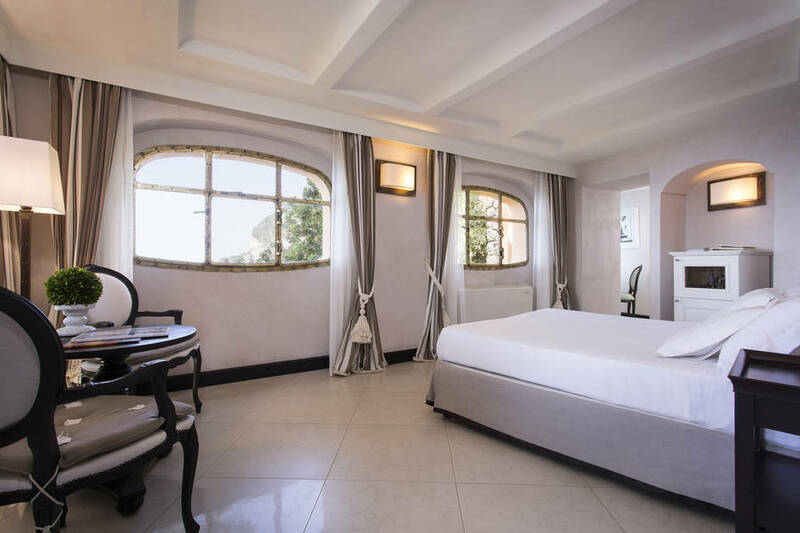 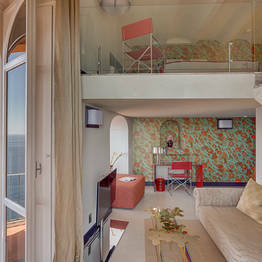 Spacious rooms with all amenities, with sea view and private balcony. 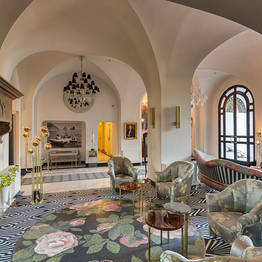 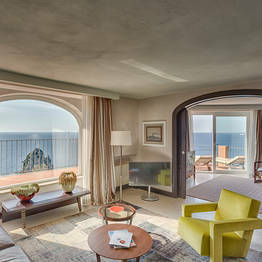 Monacone Suite is located on the 5th floor and boasts tradition and contemporary design: its large terrace overlooks magnificently the Faraglioni and surround the entire room, from the bedroom, to the magnificent living room via a wide sliding door, to the marble bathroom and panoramic bathtub. 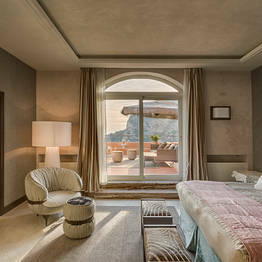 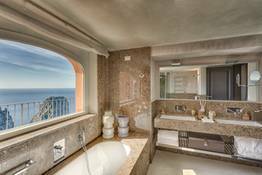 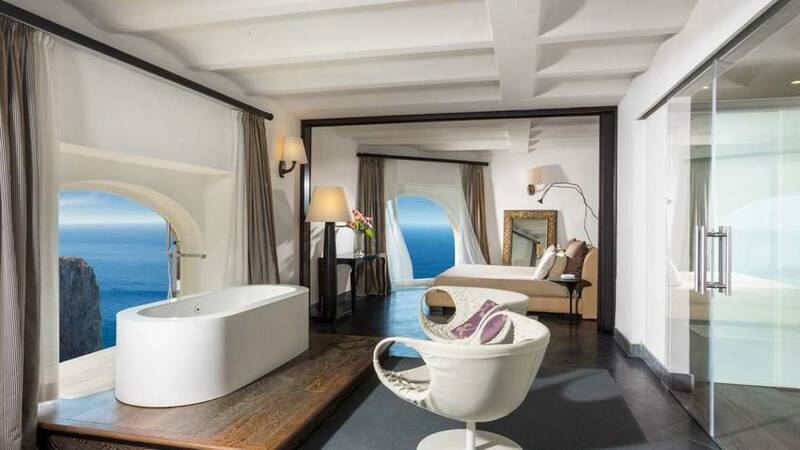 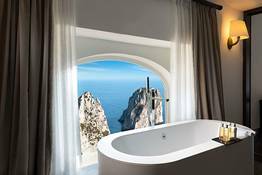 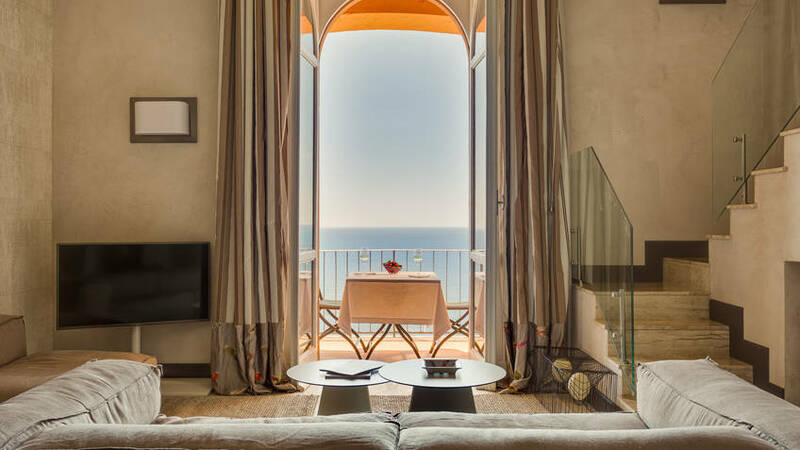 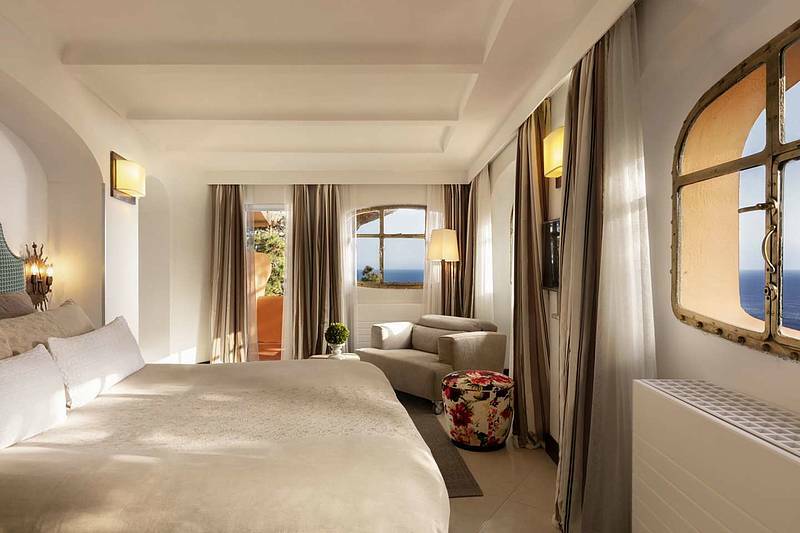 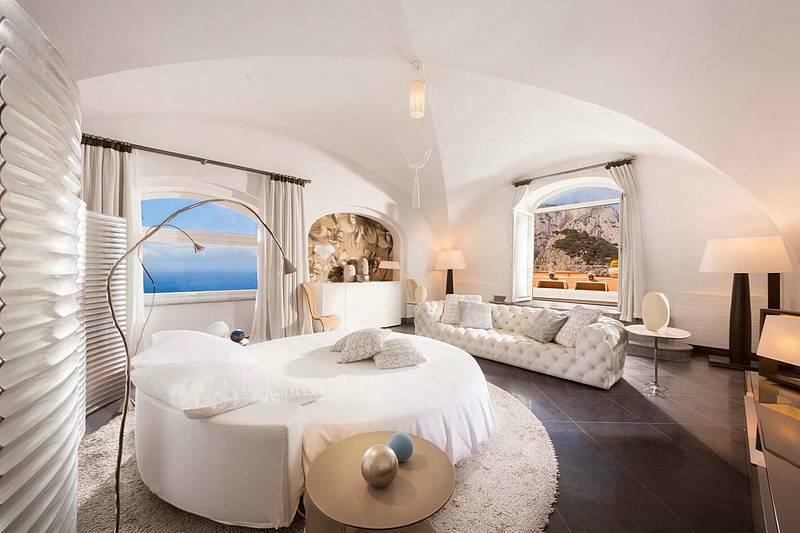 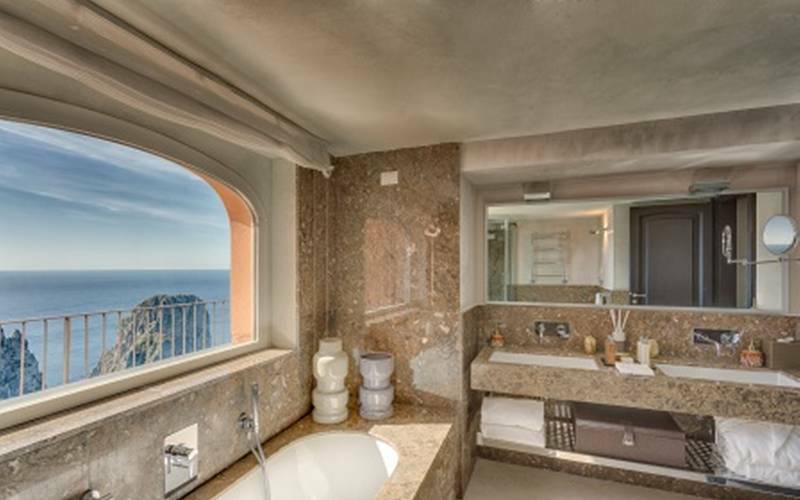 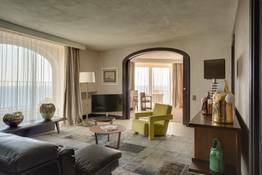 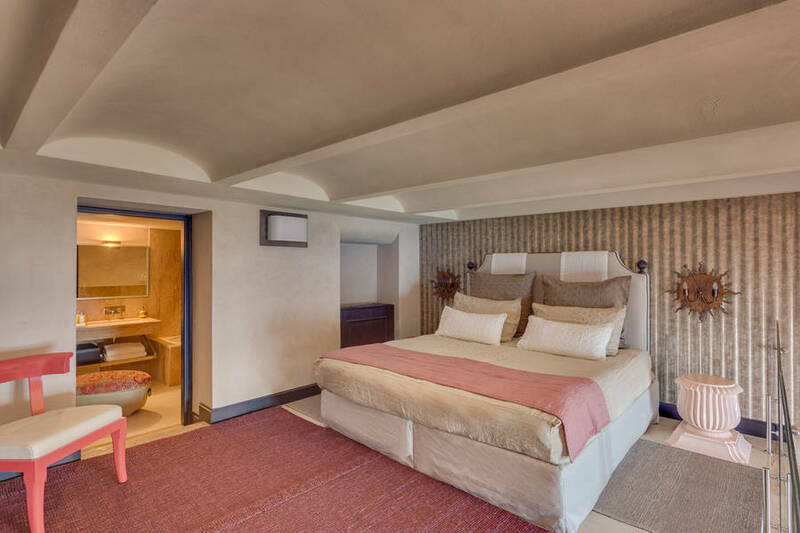 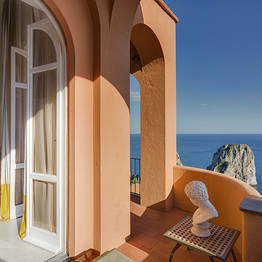 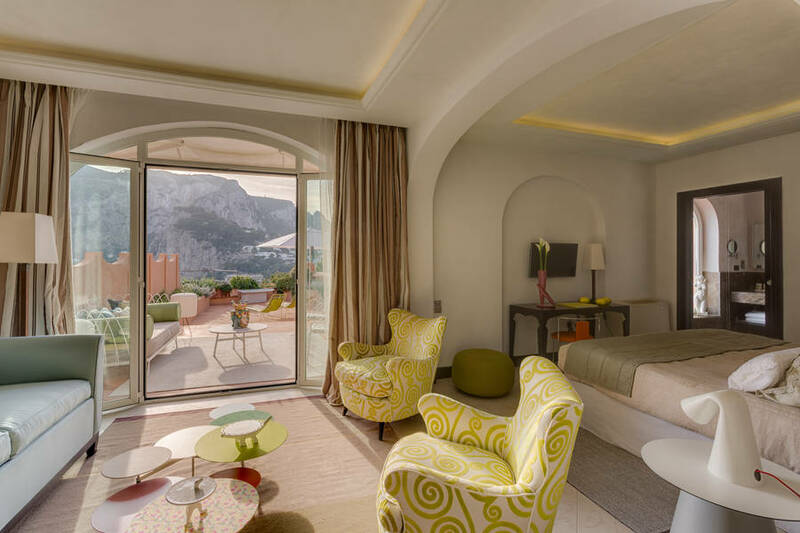 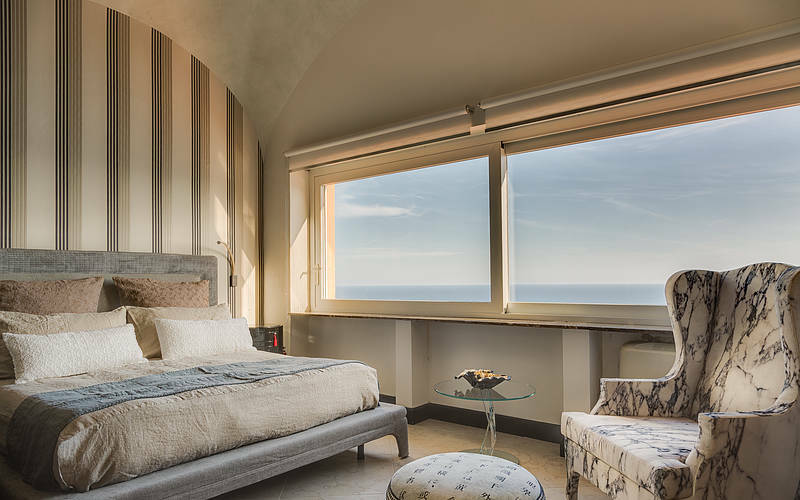 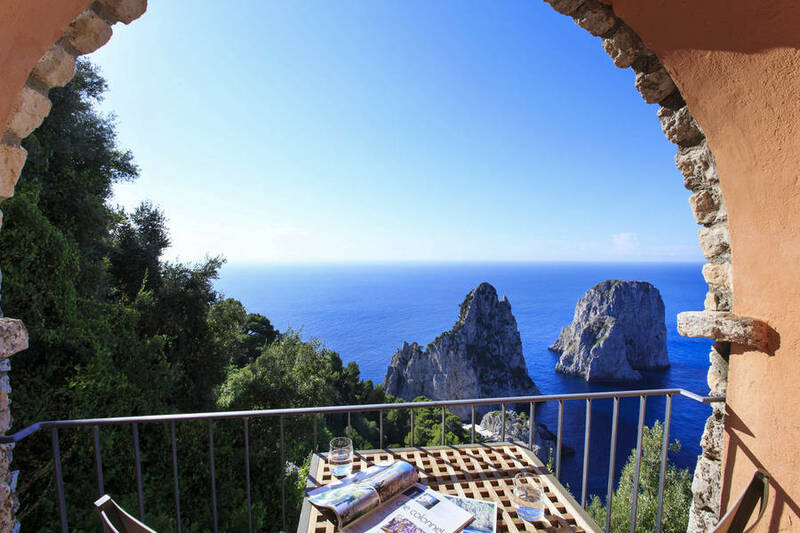 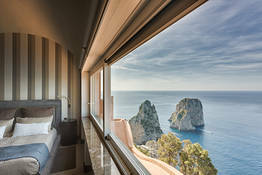 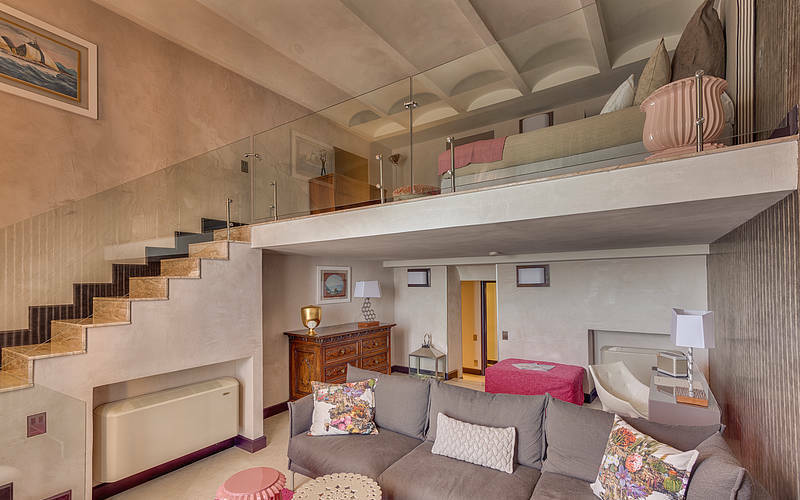 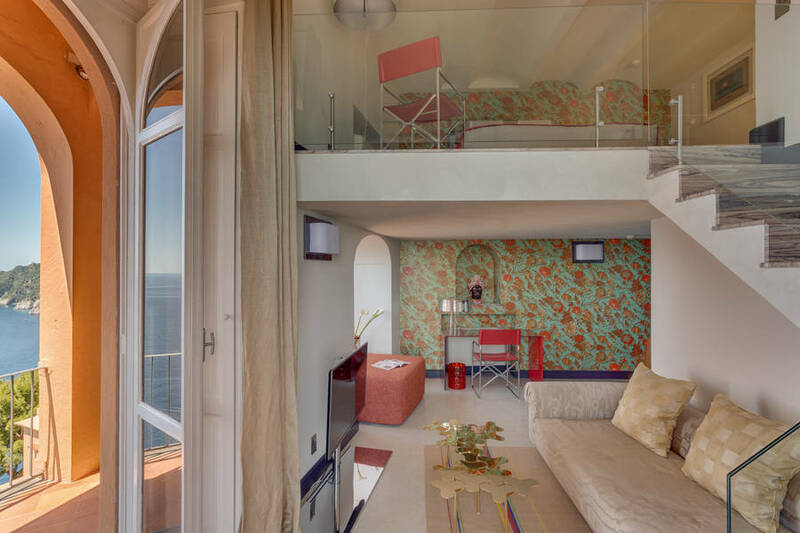 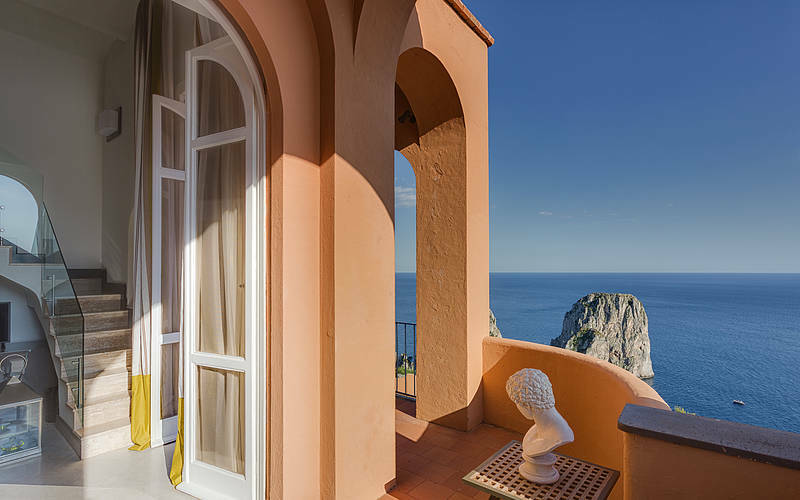 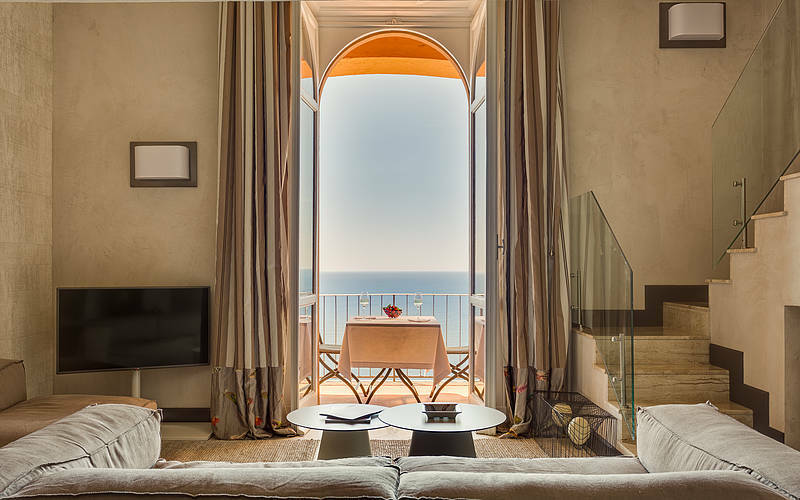 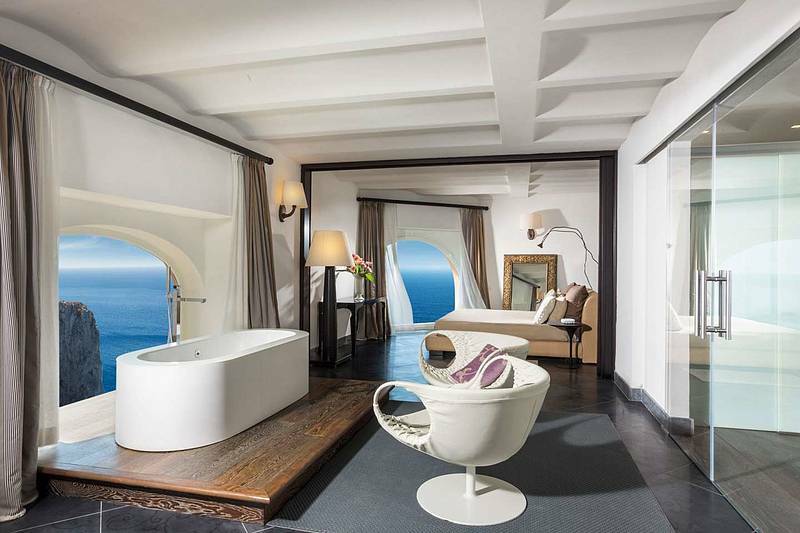 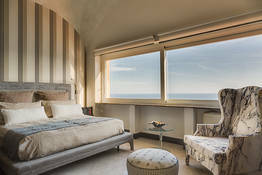 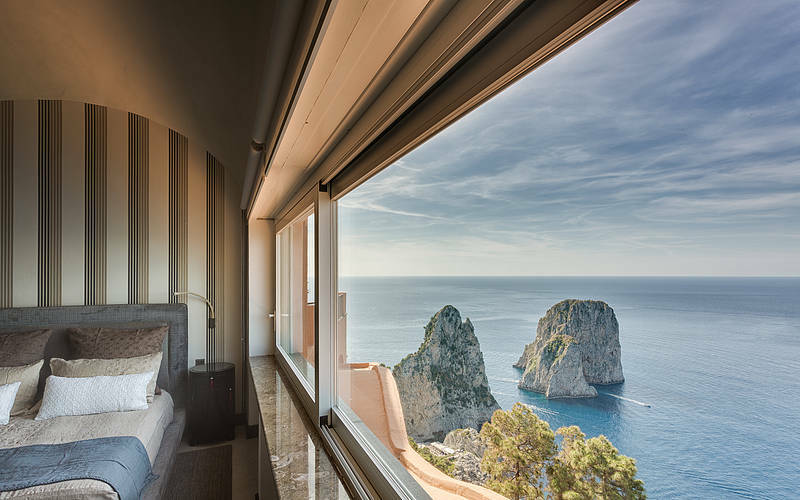 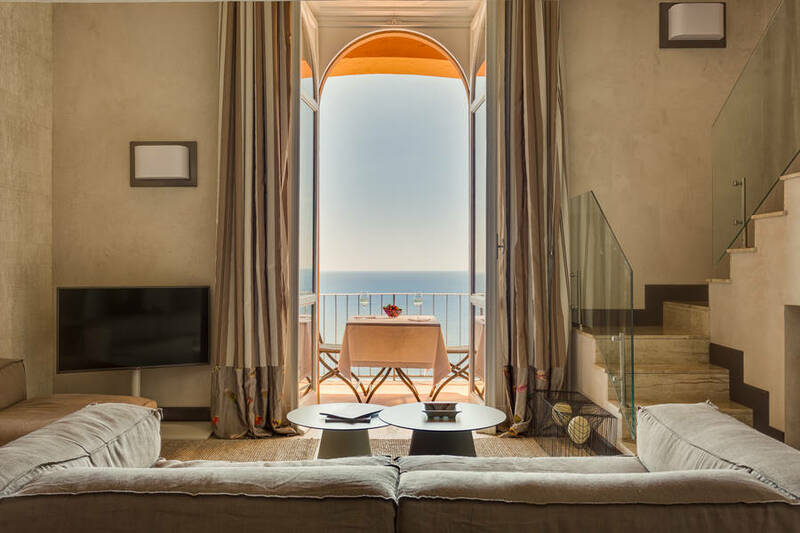 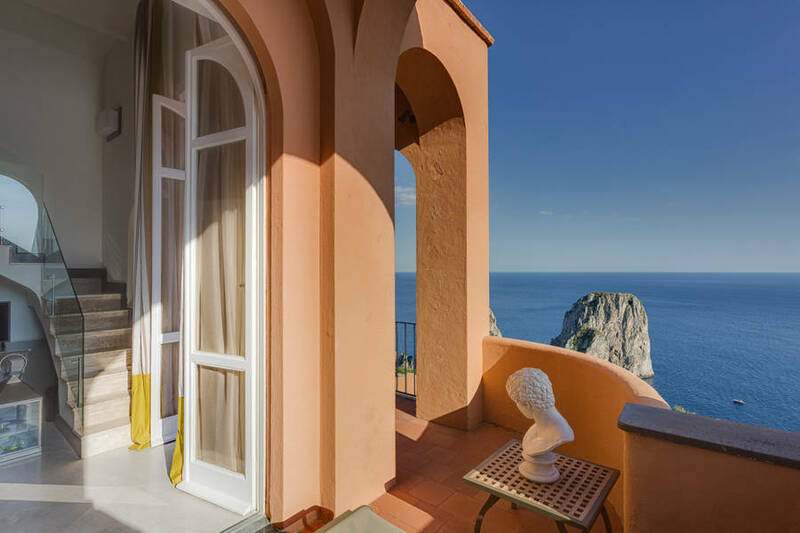 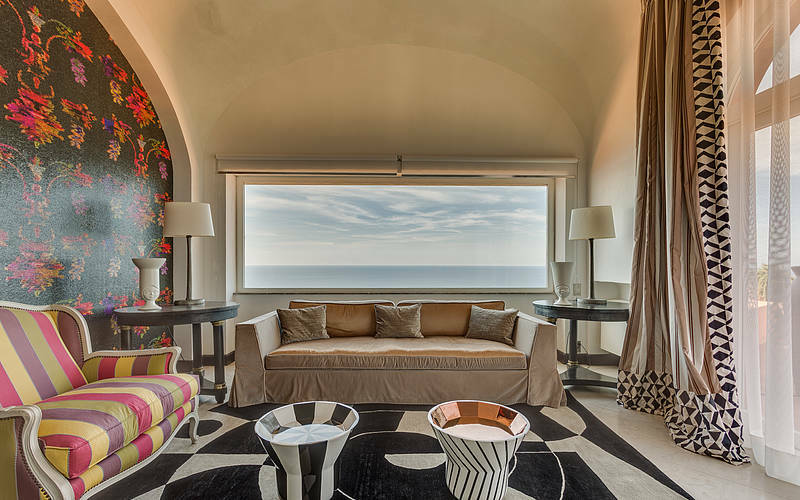 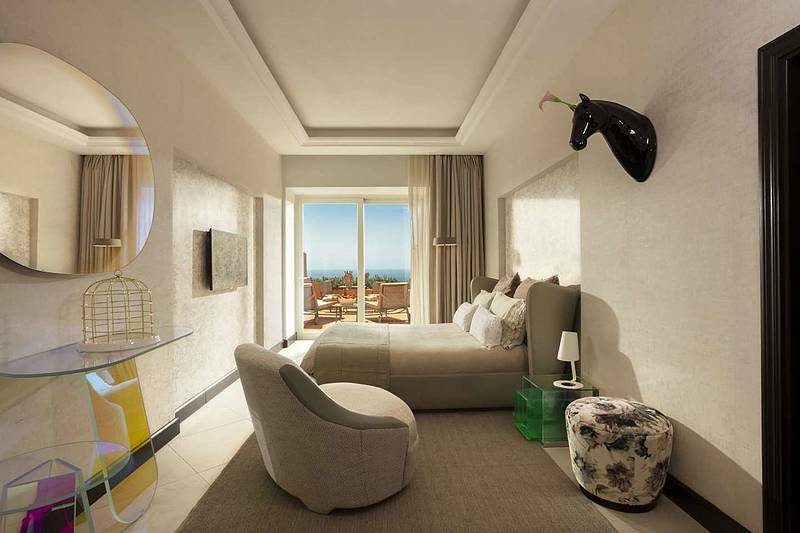 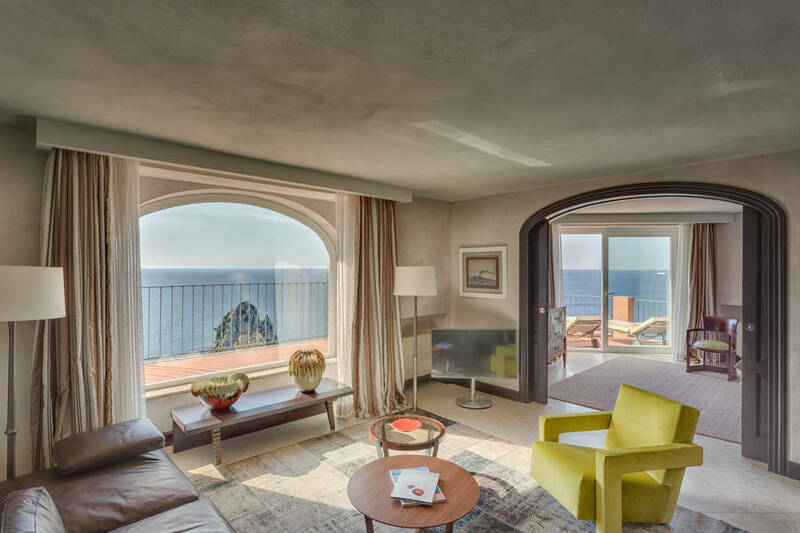 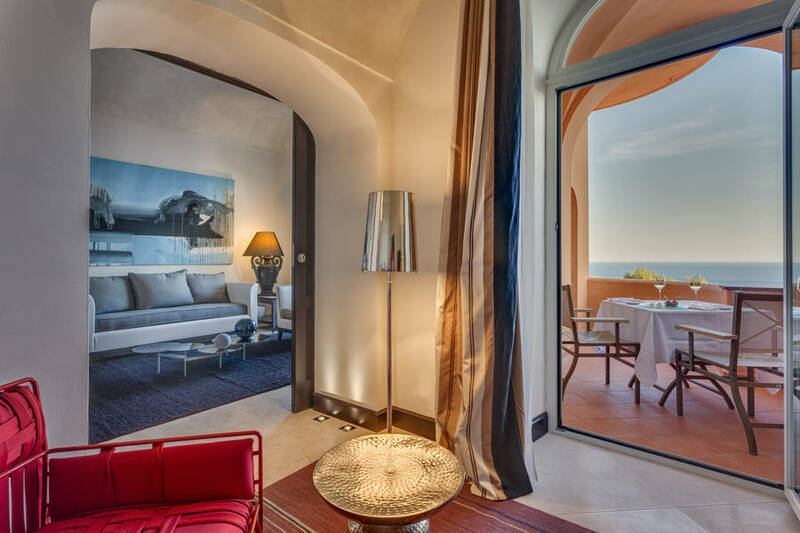 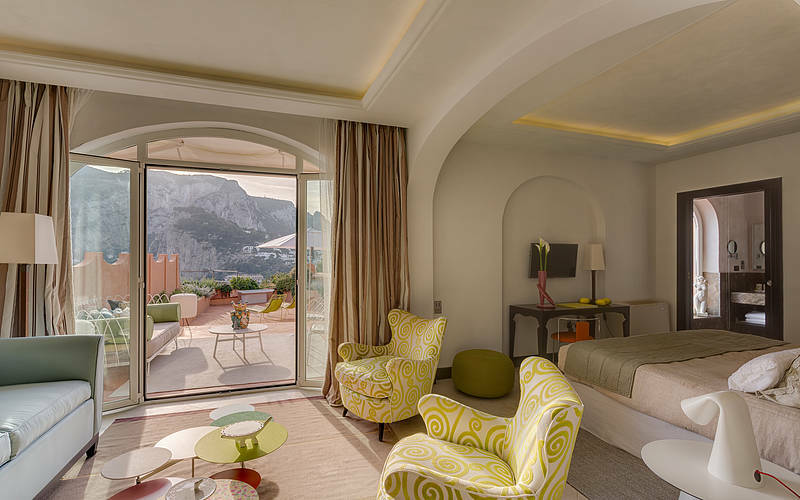 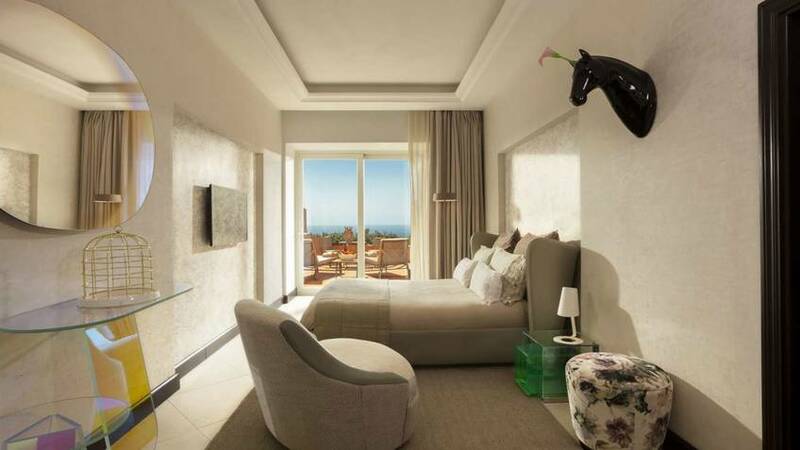 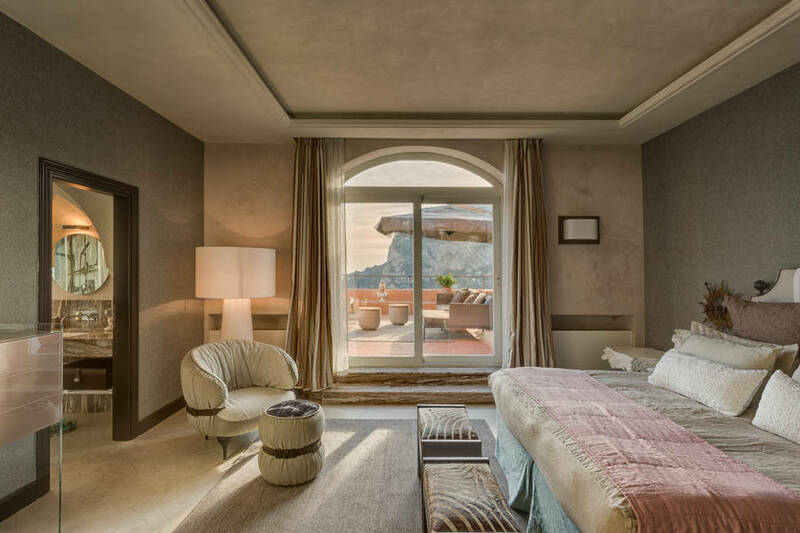 The most stunning view over the Faraglioni rocks: the Art Suite boasts a fabulous bedroom to the living room with bathtub beautifully overlooking the sea. 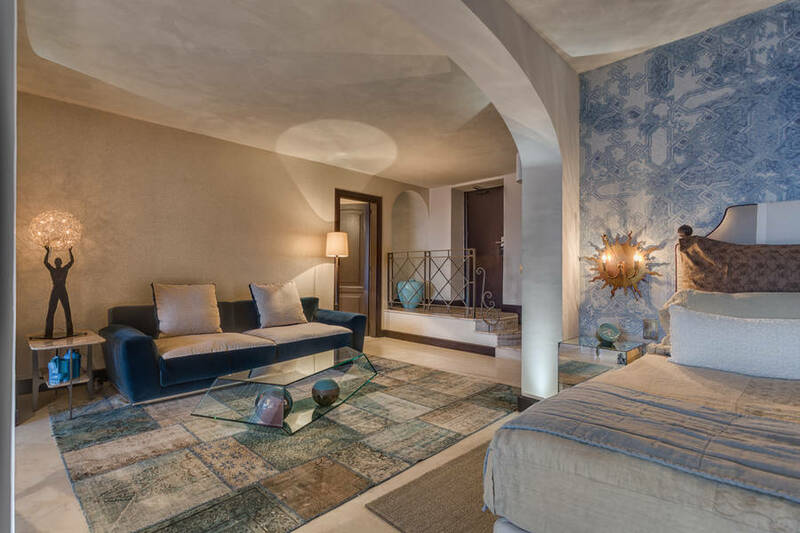 The furnishings show a blend of tradition and design. No words can explain the beauty of the landscape from the magnificent terrace. 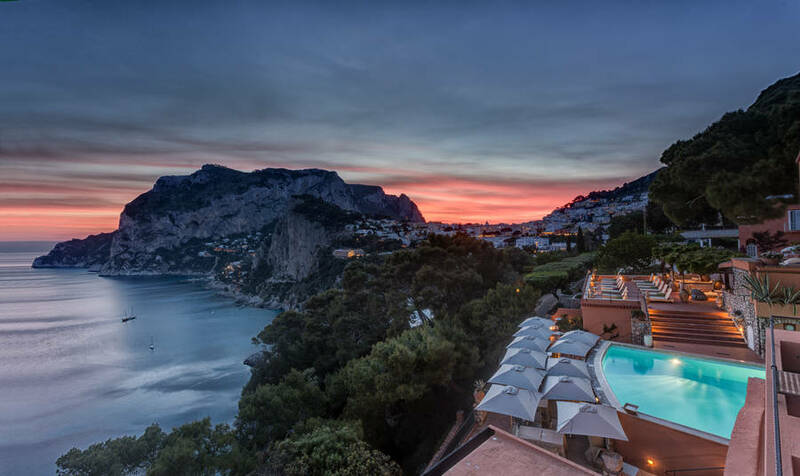 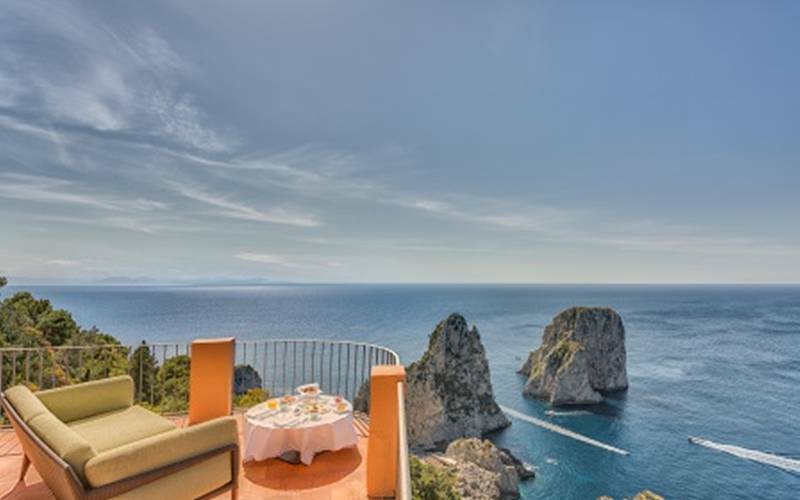 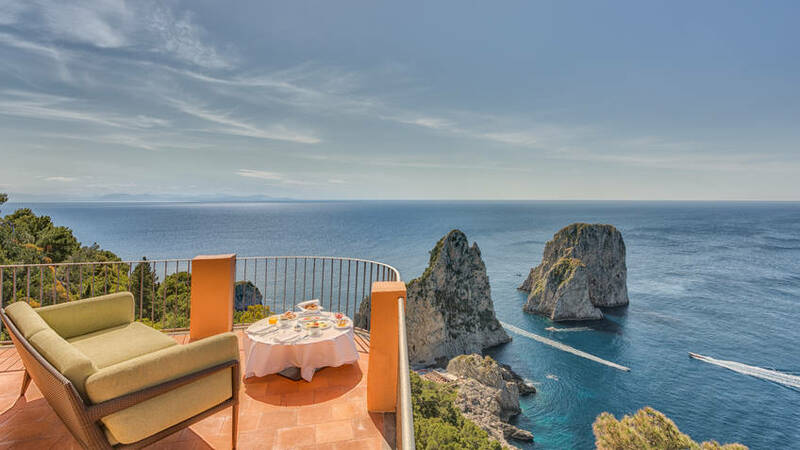 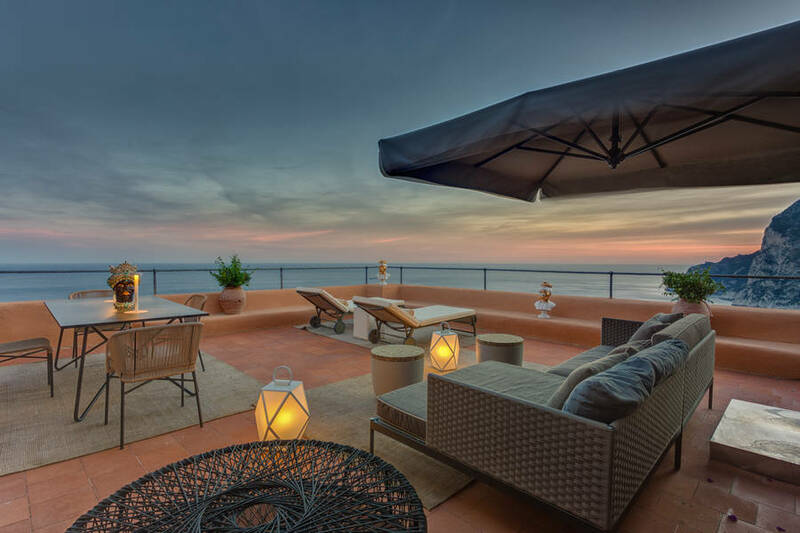 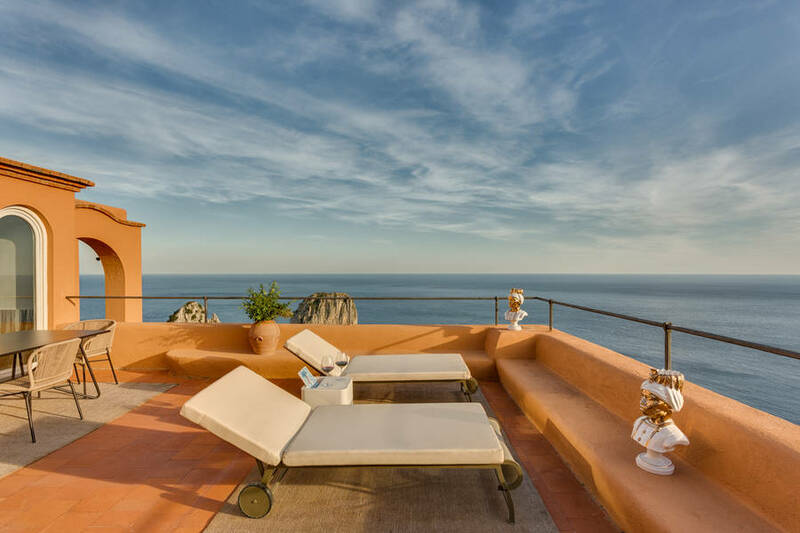 The Penthouse at Punta is located on the 5th floor of the hotel and the view from its magnificent terrace of Marina Piccola bay and the Faraglioni rocks is absolutely stunning. 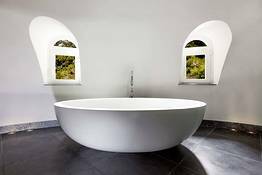 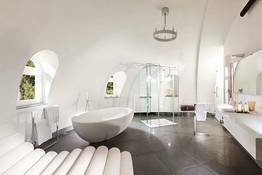 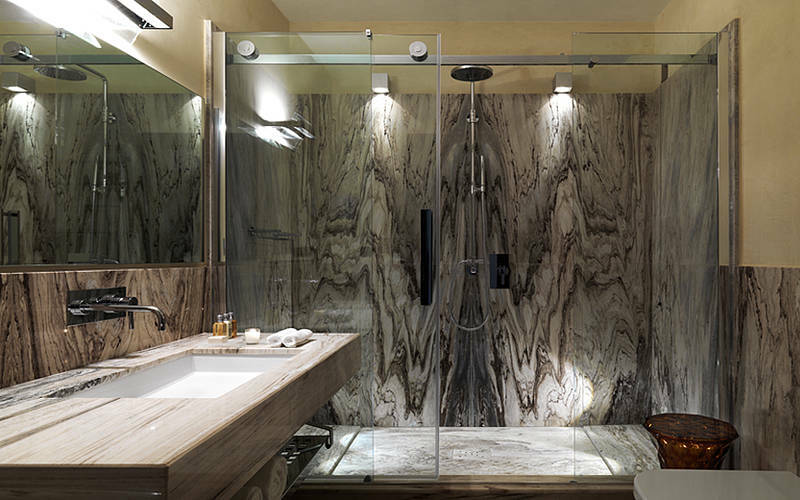 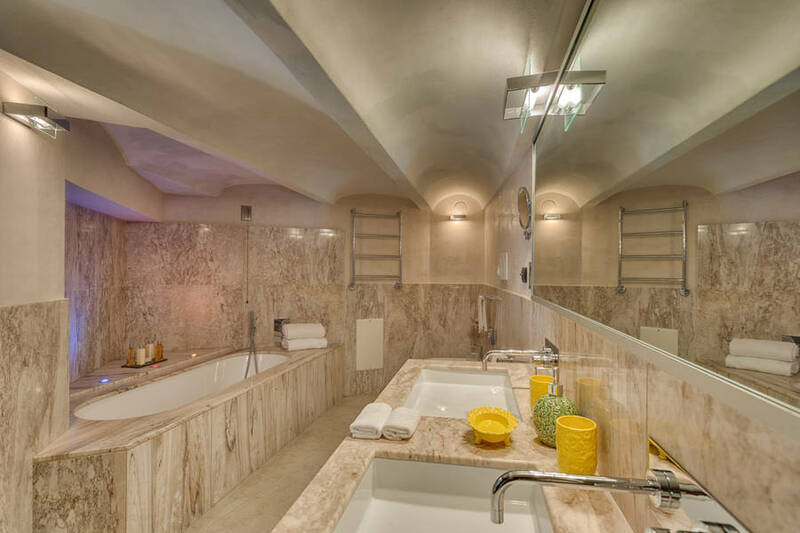 The penthouse has a large living area adjoining the bedroom with a circular bed, sweeping into the bathroom with central shower and bathtub. 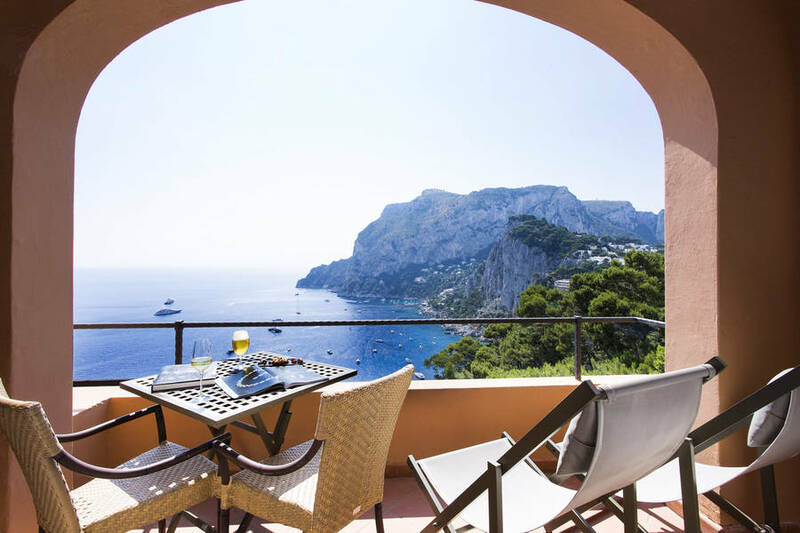 From Capri's Piazzetta, a pathway immersed in the vibrant colors and sweet scents of the island's Mediterranean flora guides visitors to the Punta Tragara viewpoint, and one of the world's most sought after hotels. 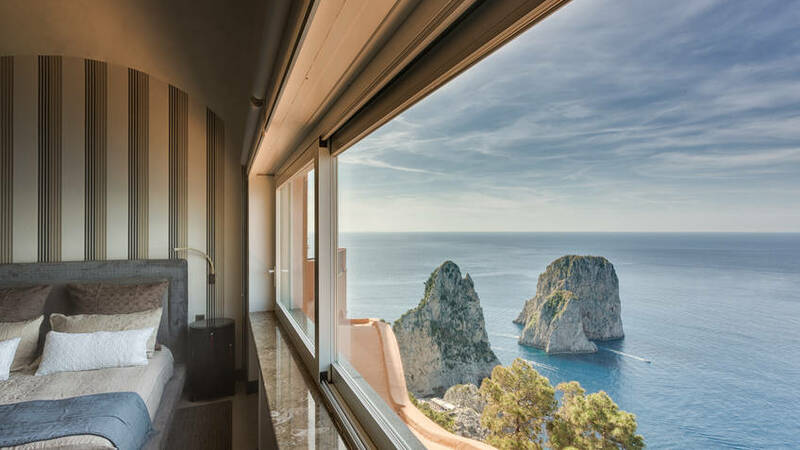 The views of the sea and the legendary Faraglioni rocks which can be observed from Hotel Punta Tragara are simply stunning, as is the architect Le Corbusier's design for the hotel building which is both striking in its contemporary feel yet in total harmony with the island scenery. 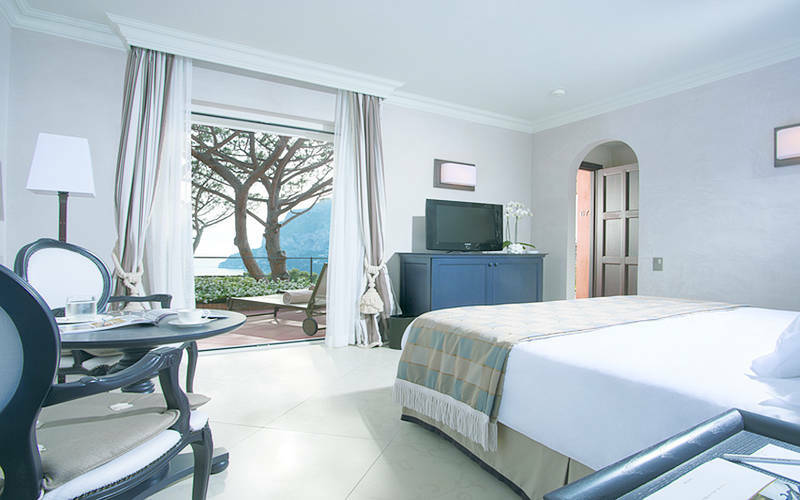 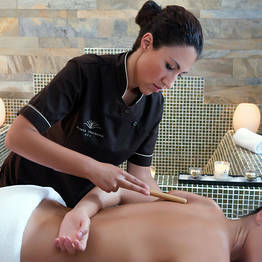 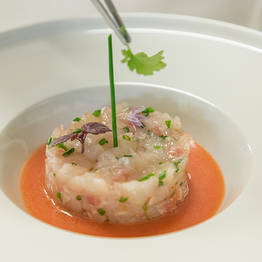 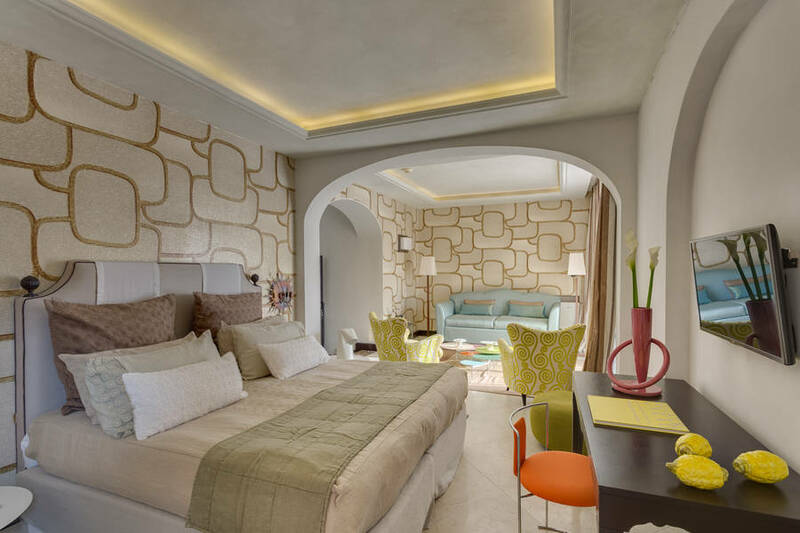 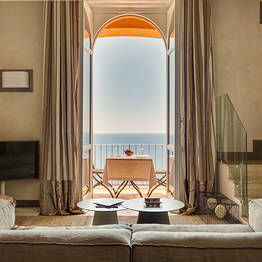 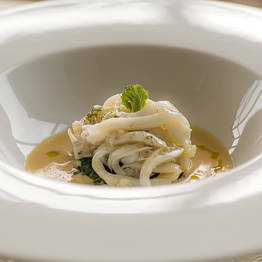 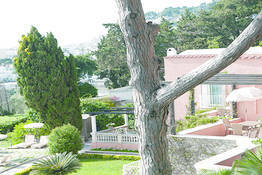 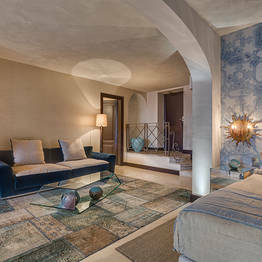 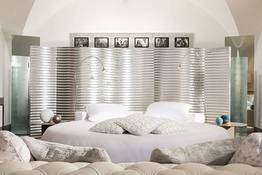 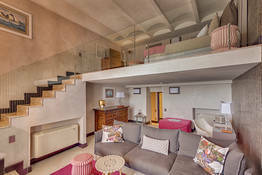 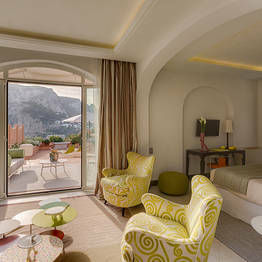 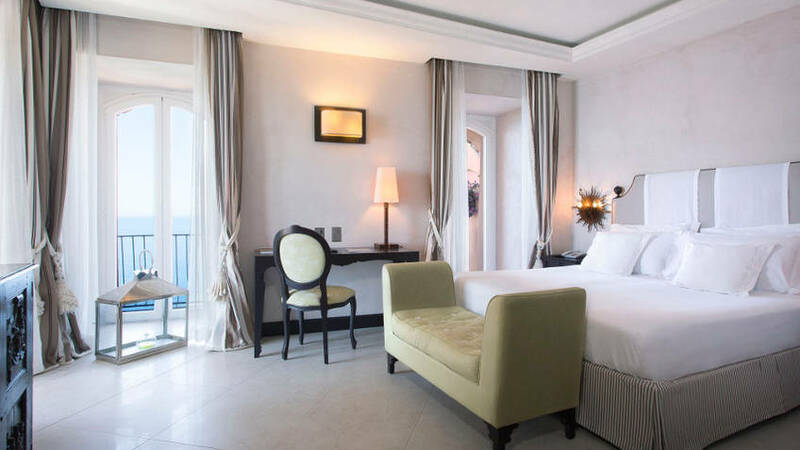 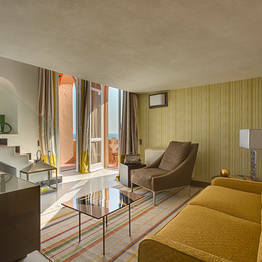 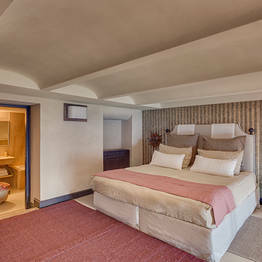 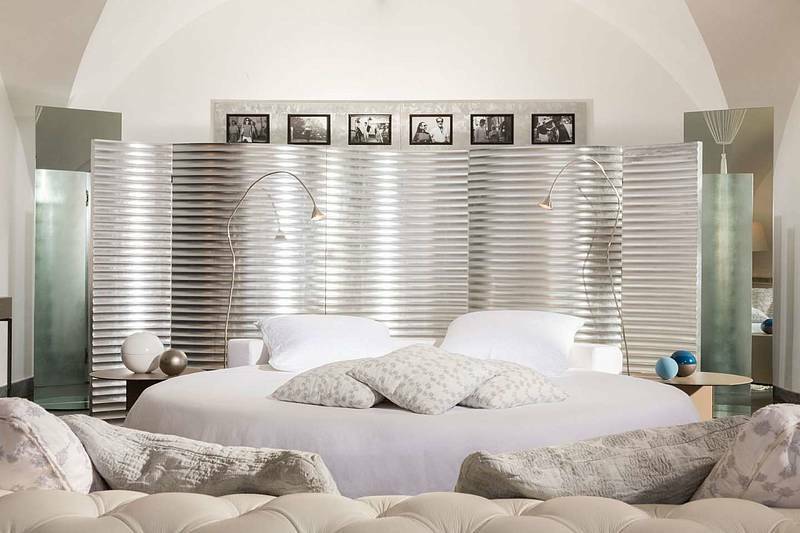 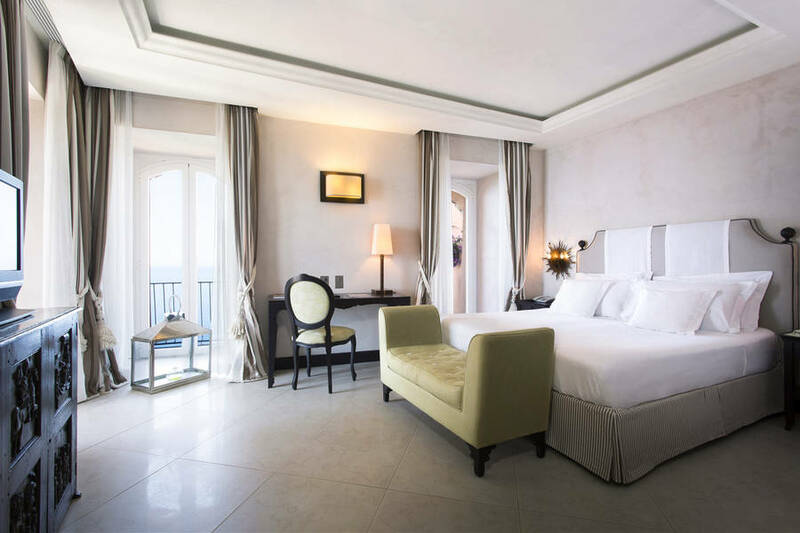 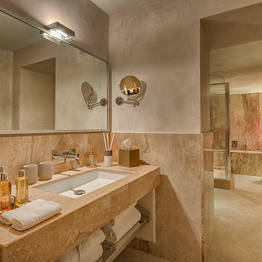 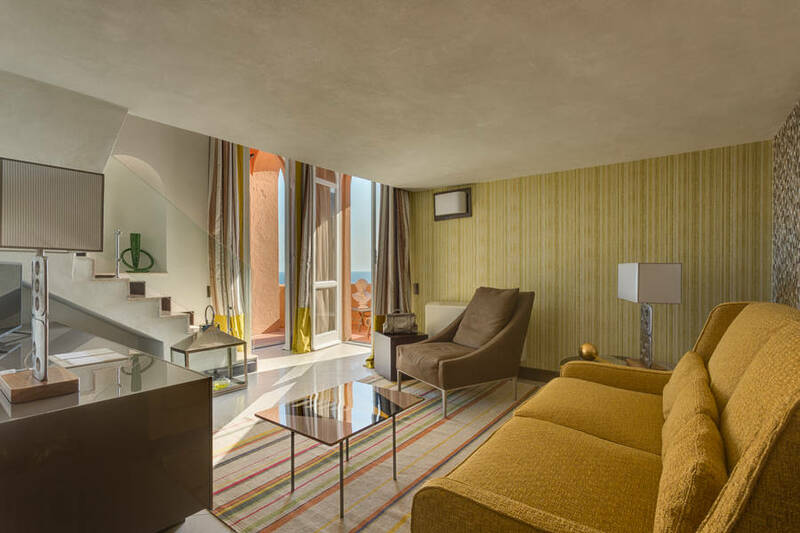 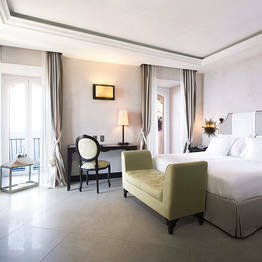 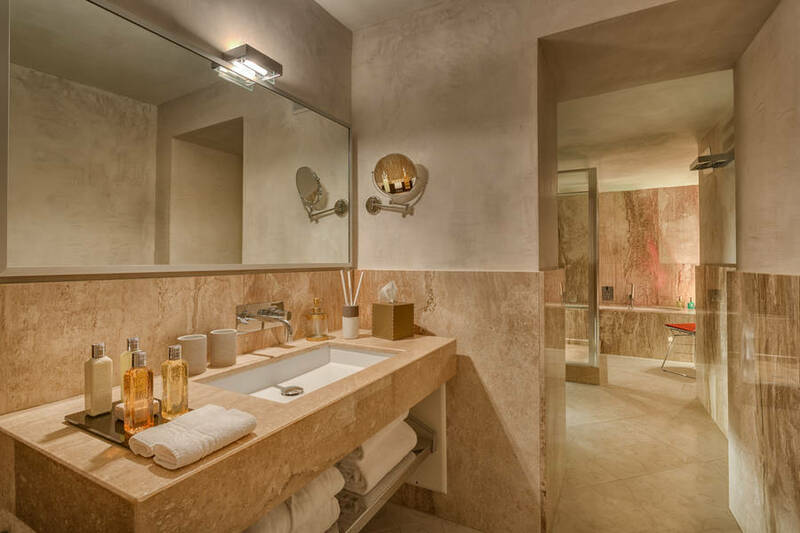 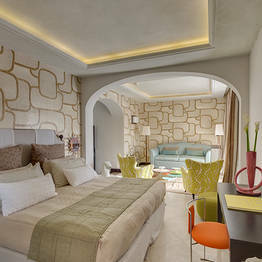 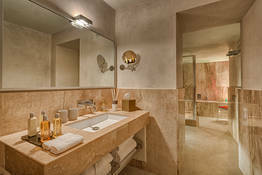 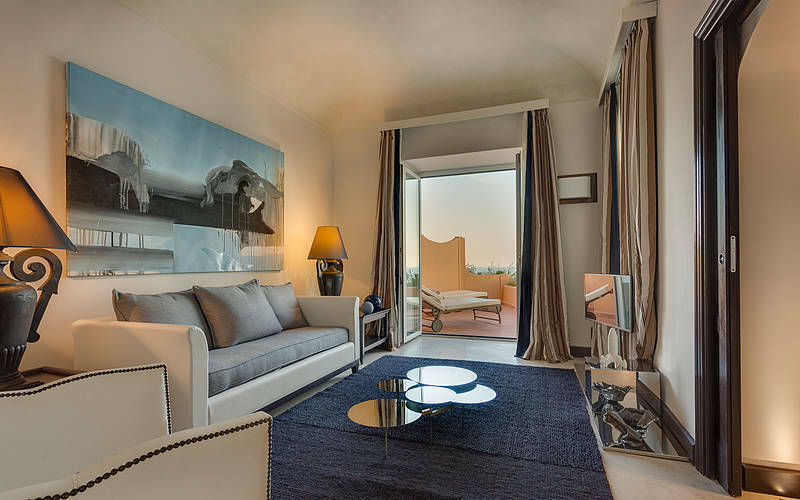 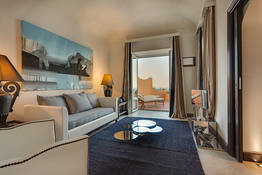 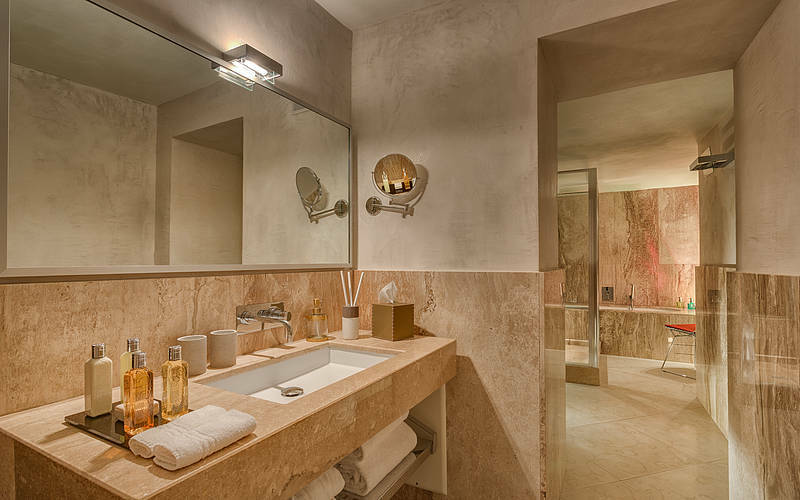 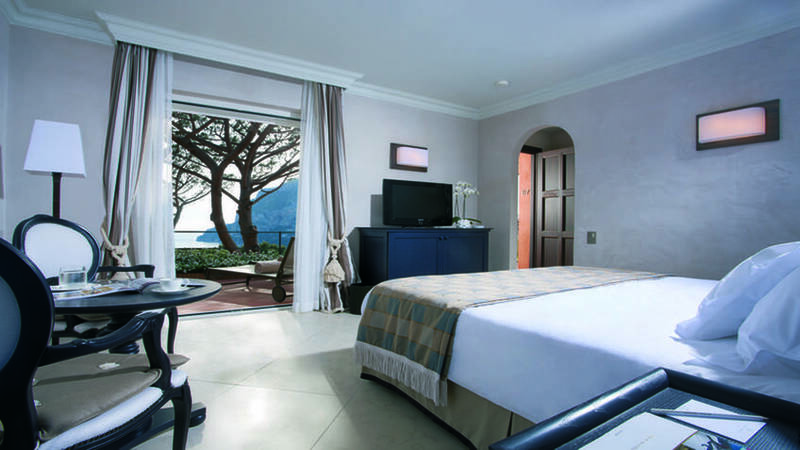 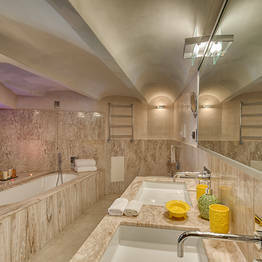 Guests staying at the Punta Tragara Hotel sojourn in beautifully appointed rooms, equipped with every modern comfort. 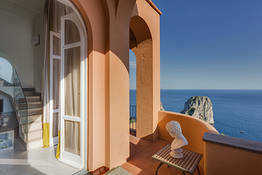 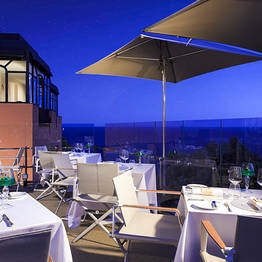 The ultimate expression of Italian elegance, the hotel's Art, Monacone, Certosa and Penthouse Suites, all of which boast magnificent views of the Faraglioni rocks and the Bay of Marina Piccola, are furnished in a sleek contemporary style which perfectly complements the hotel's bold architectural style. 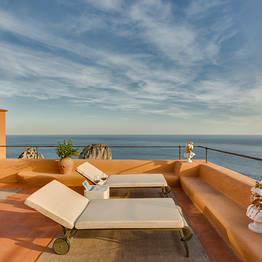 It's easy to leave the stress and strains of everyday life behind you at Punta Tragara. 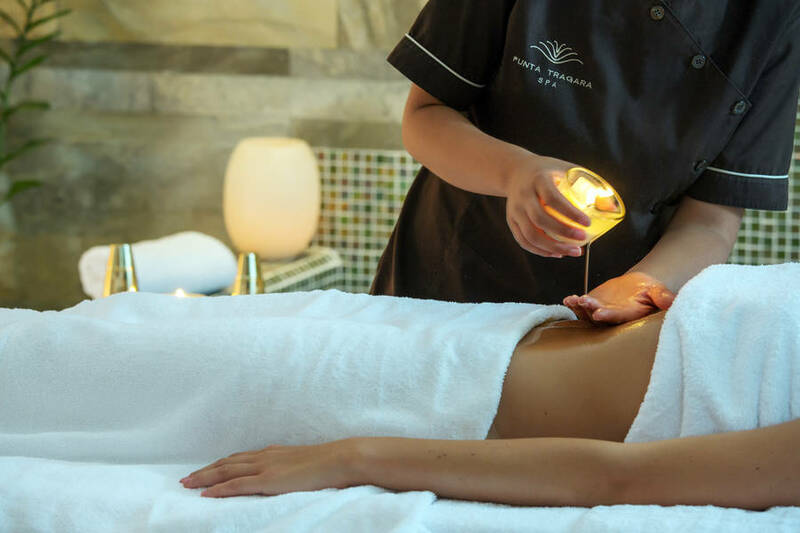 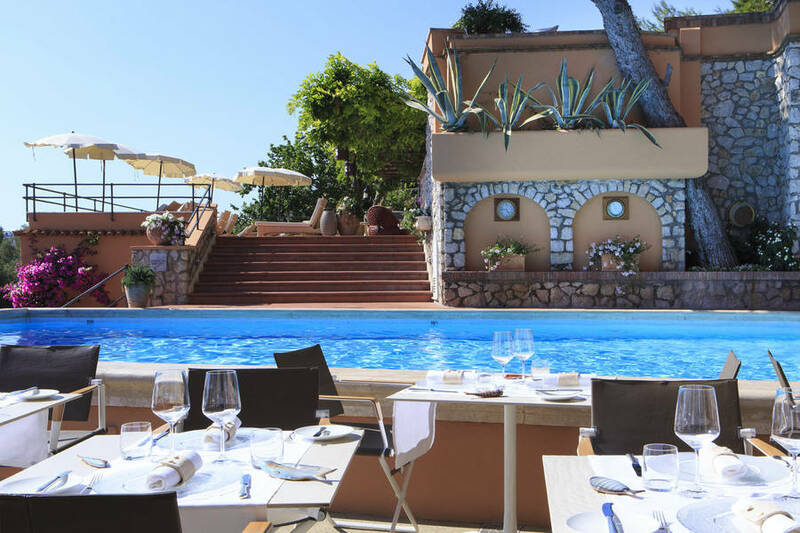 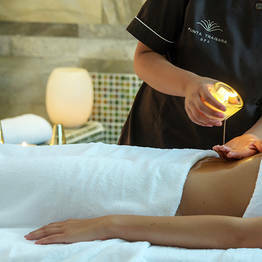 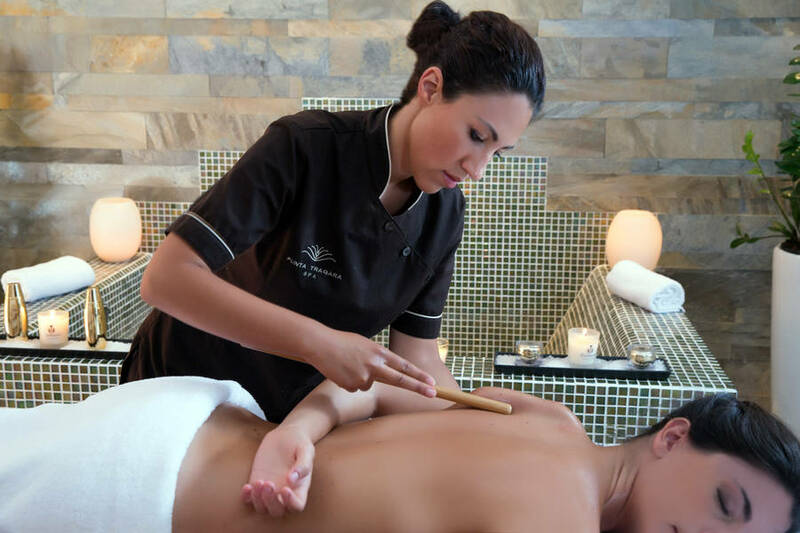 Whether you choose to spend the day lazing in the hotel's gorgeous sub-tropical gardens; sunbathing by the pool (the hotel has two); or indulging in a little professional pampering in the spa, at Punta Tragara the relaxation is guaranteed. 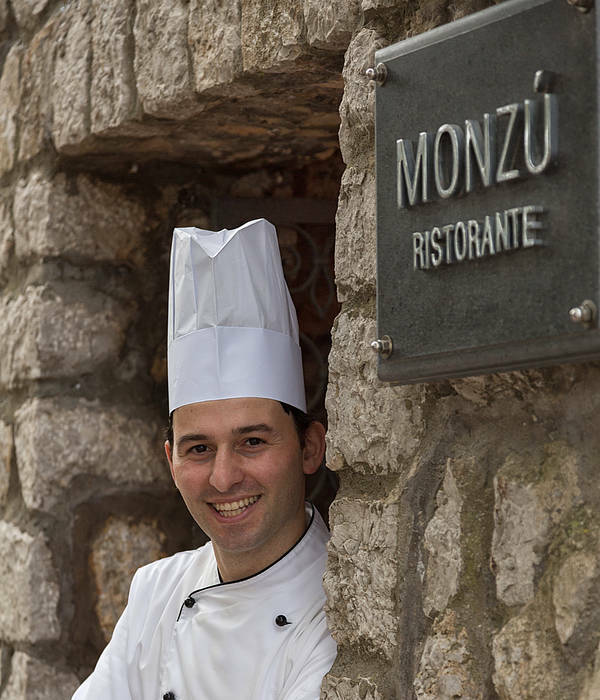 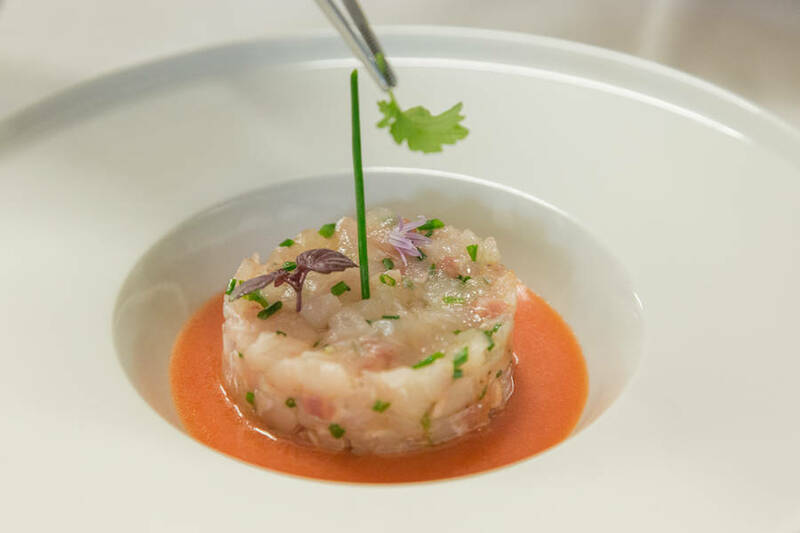 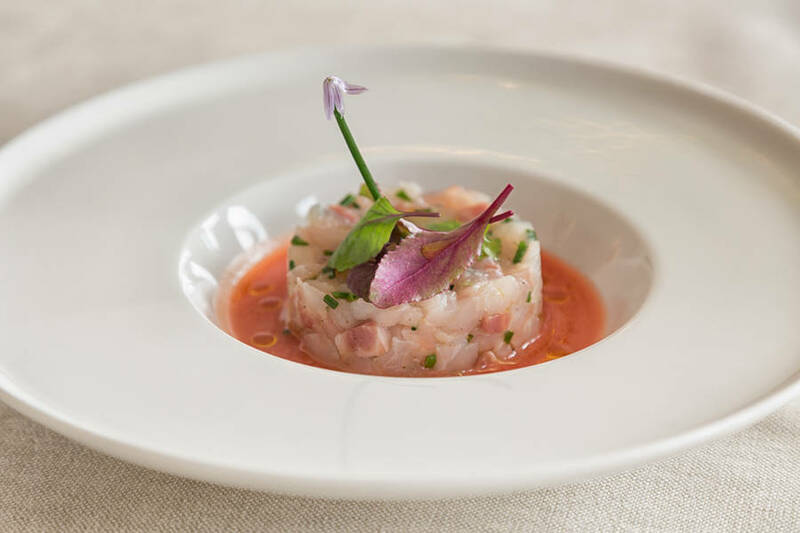 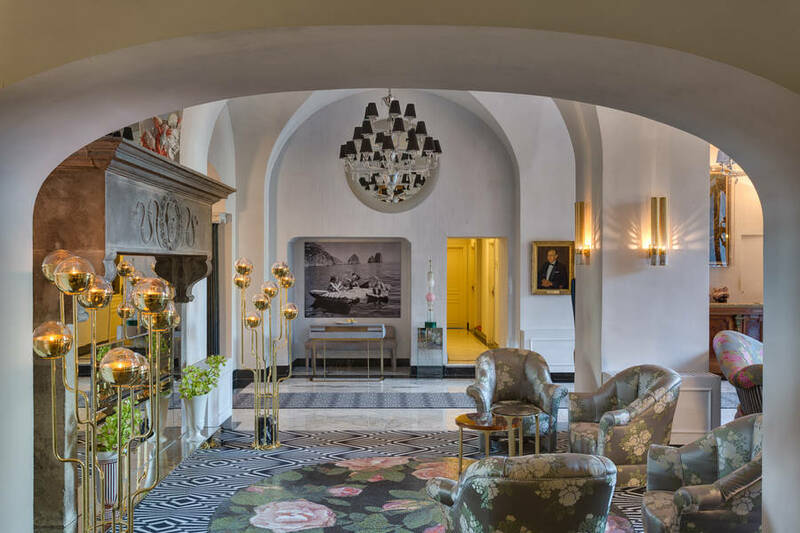 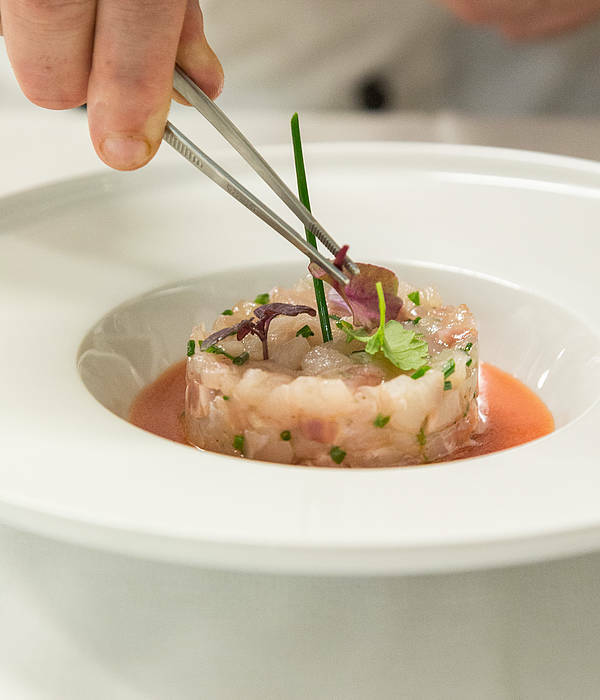 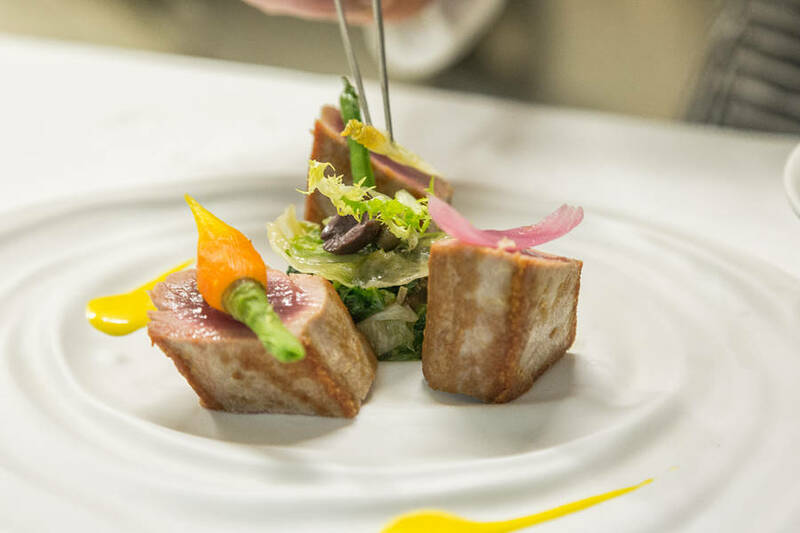 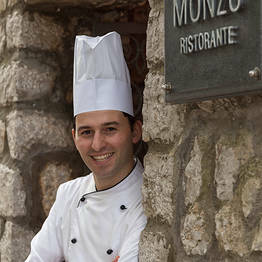 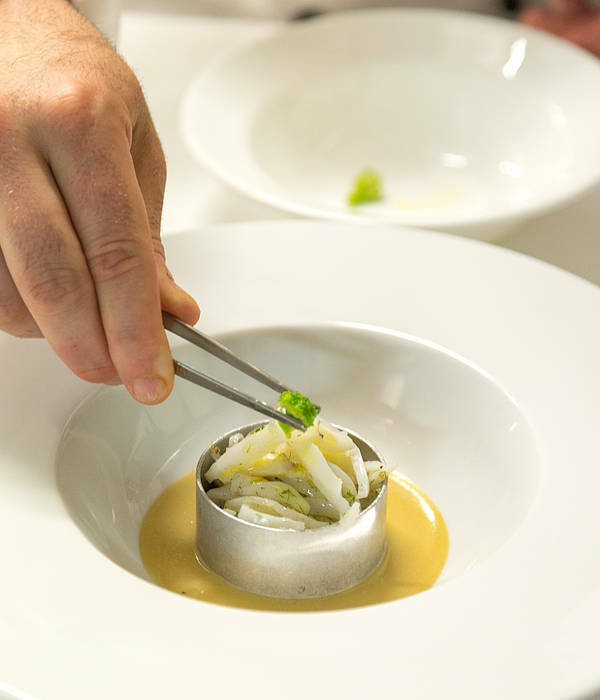 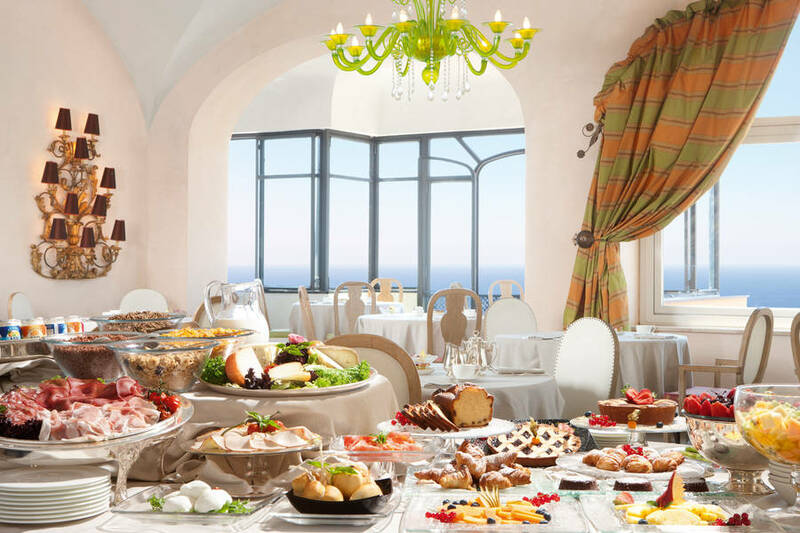 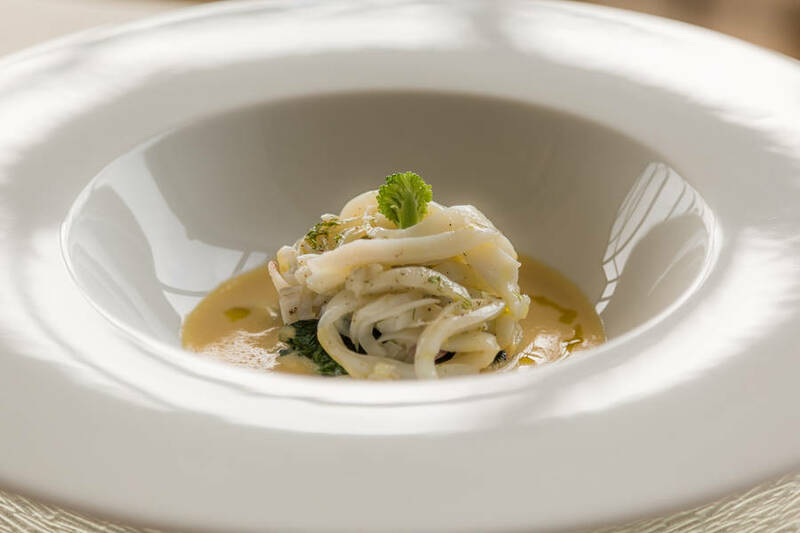 The hotel's elegant "Monzù" Restaurant, provides the ideal venue in which to enjoy a romantic dinner for two or celebrate a special occasion amongst family or friends. 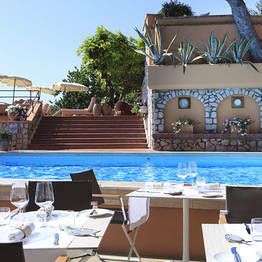 At lunch time, tasty fish and seafood specialties are served by the pool. 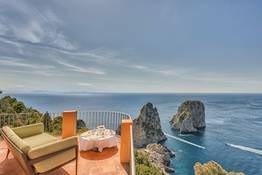 "The location, directly opposite the Faraglioni, is, without a shadow of doubt, the most spectacular on the whole island. " 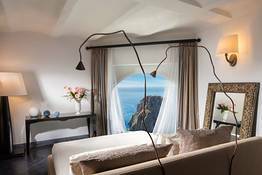 "It's a pleasant 15 minute walk from the center of Capri, along a little lane brimming with beautifully scented flowers. " 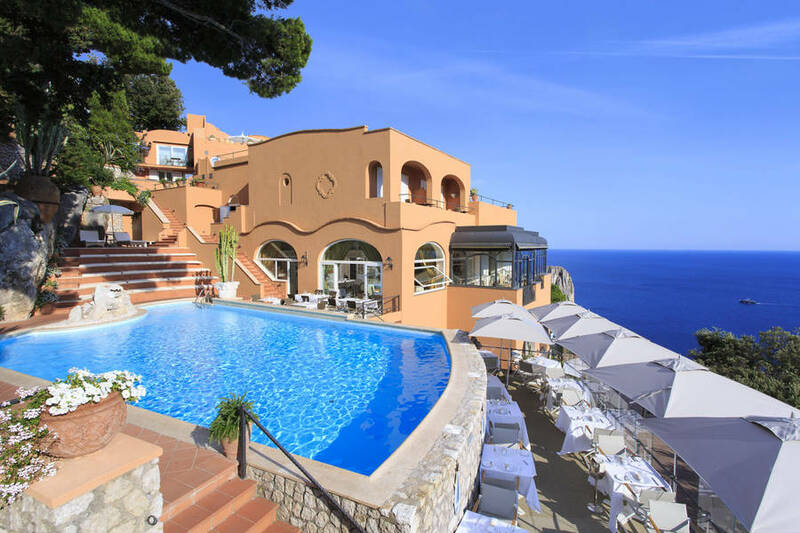 "A magnificent pool with a spectacular view. " 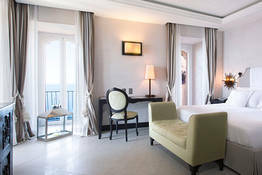 "Even the standard rooms are wonderfully luxurious. " 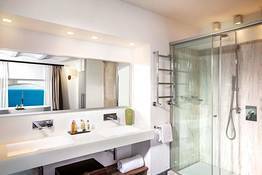 "The unimpeachable staff ensure that everything, from the moment you make your reservation to the moment you check out, runs smoothly." 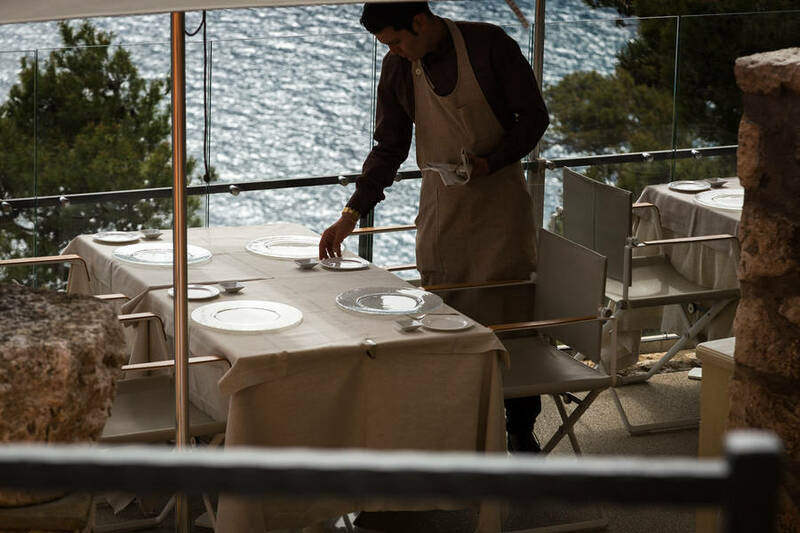 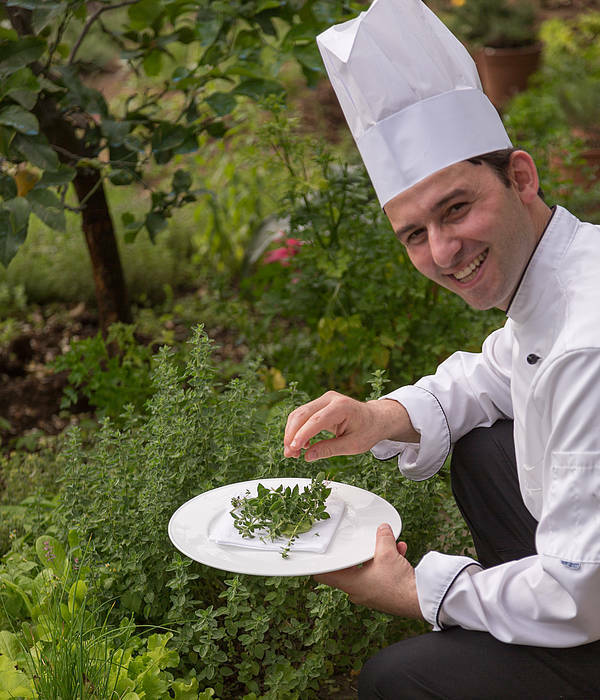 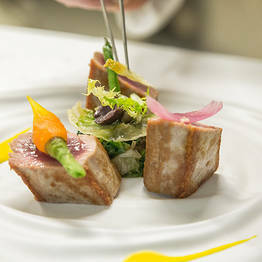 "Staff are always present and more than happy to satisfy guests' requests. " 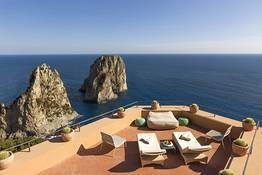 "You feel like you're a guest in a luxurious private villa and not a hotel. " 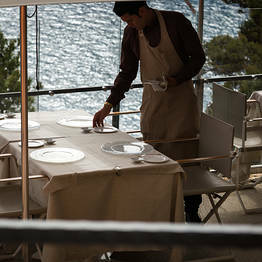 Absolutely Heaven- Everything was Impeccable! 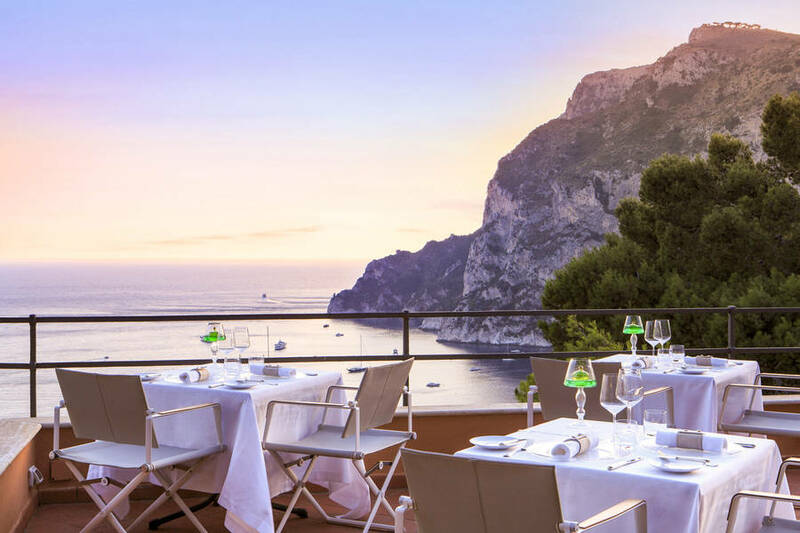 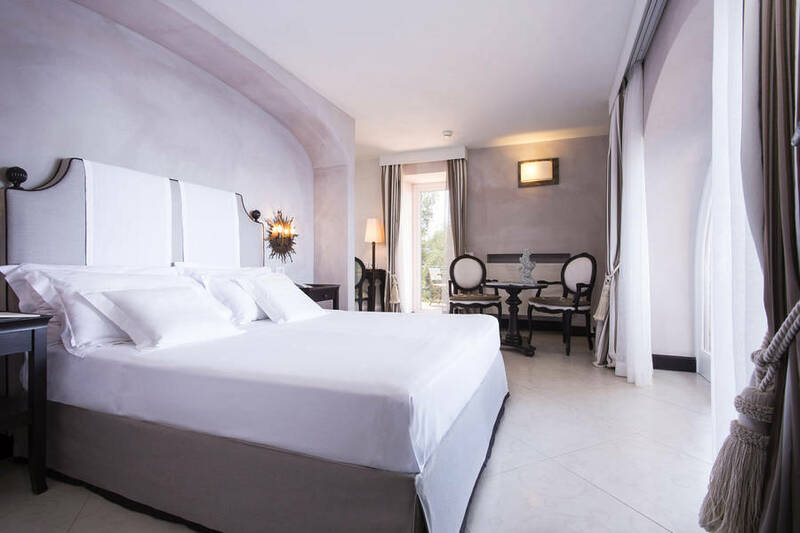 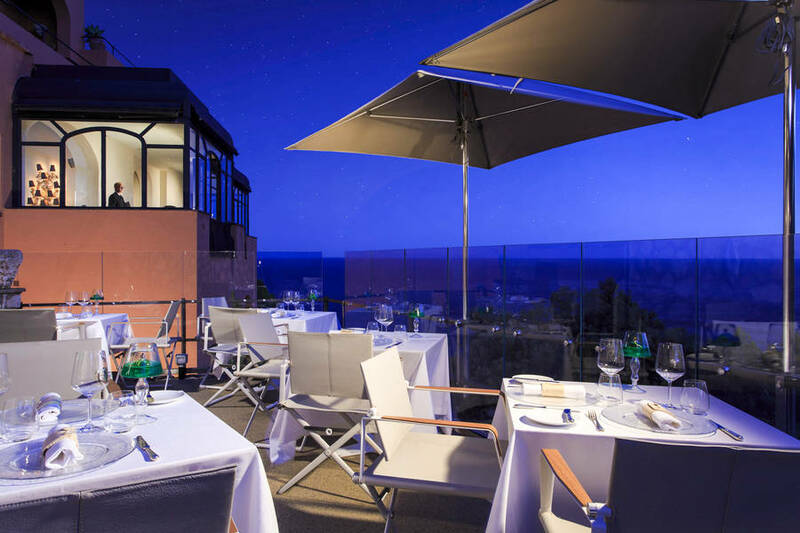 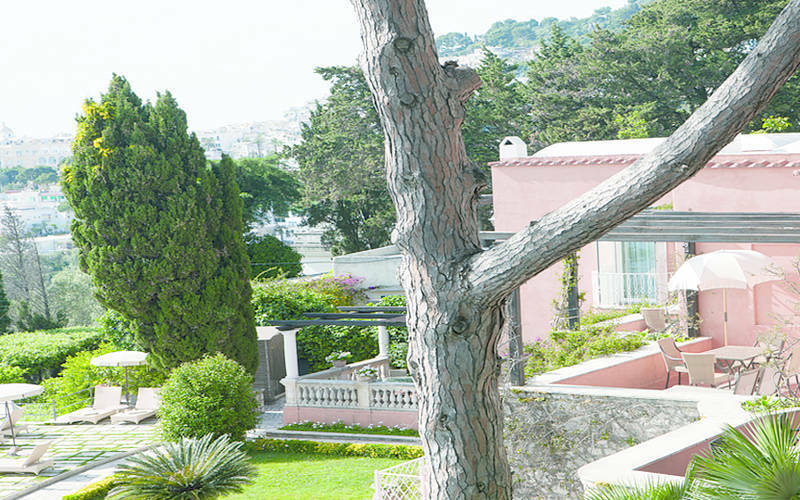 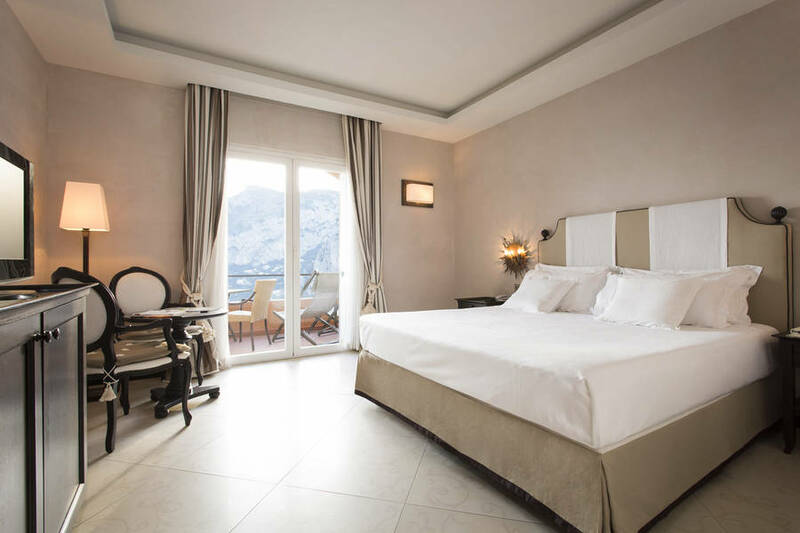 Hotel Punta Tragara is situated right next to the Belvedere di Punta Tragara, from where to admire a magnificent view of the Capri's legendary Faraglioni, the Bay of Marina Piccola and a glimpse or two of Capri's picturesque town center. 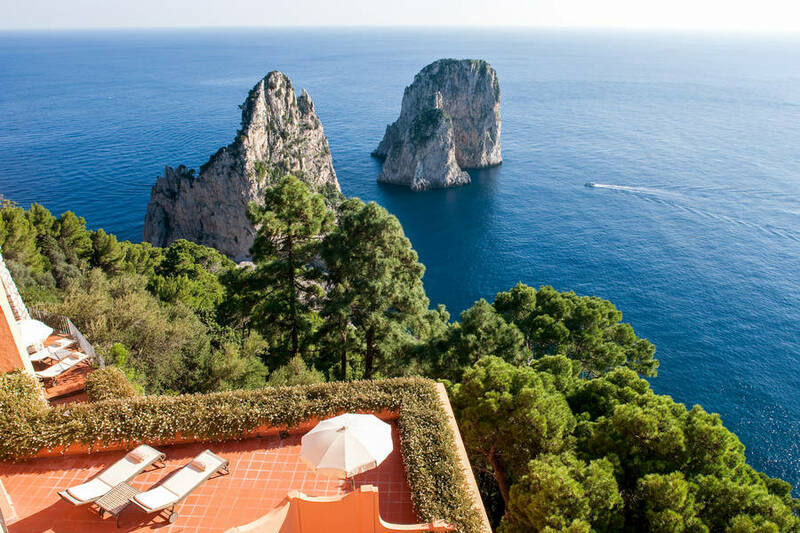 To reach the hotel, guests walk along one of the island of Capri's most attractive pathways, where to observe spectacular displays of brightly colored Mediterranean flowers, cascading over the walls of some of the island's most beautiful residential properties. 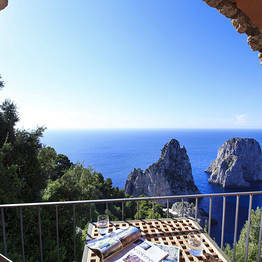 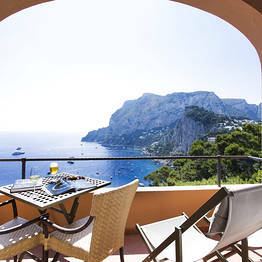 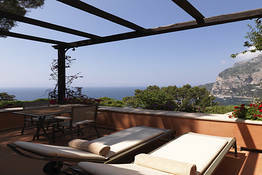 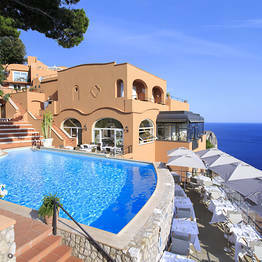 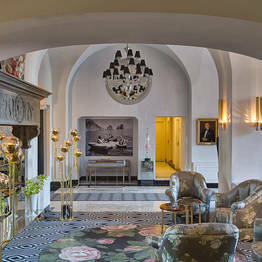 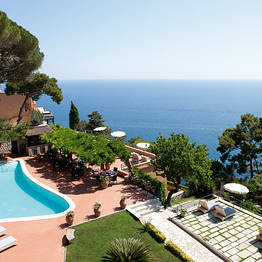 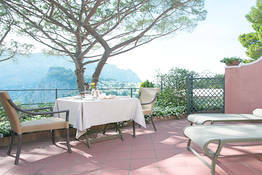 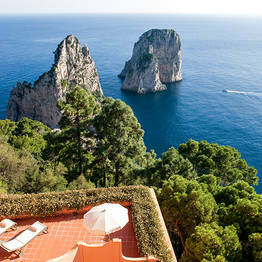 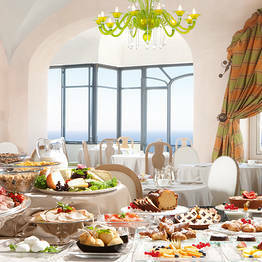 Book Hotel Punta Tragara on Capri.com now with no additional booking fees.